1. 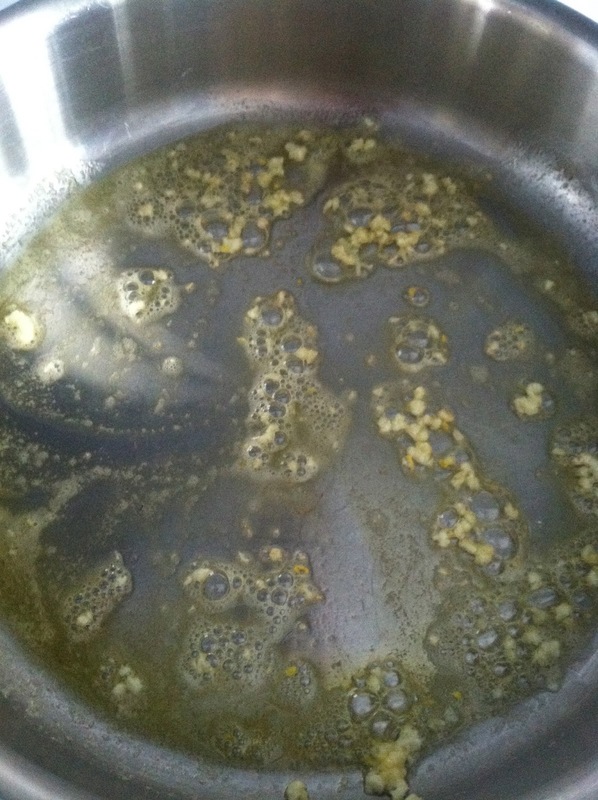 Melt the butter and EVOO over medium heat. 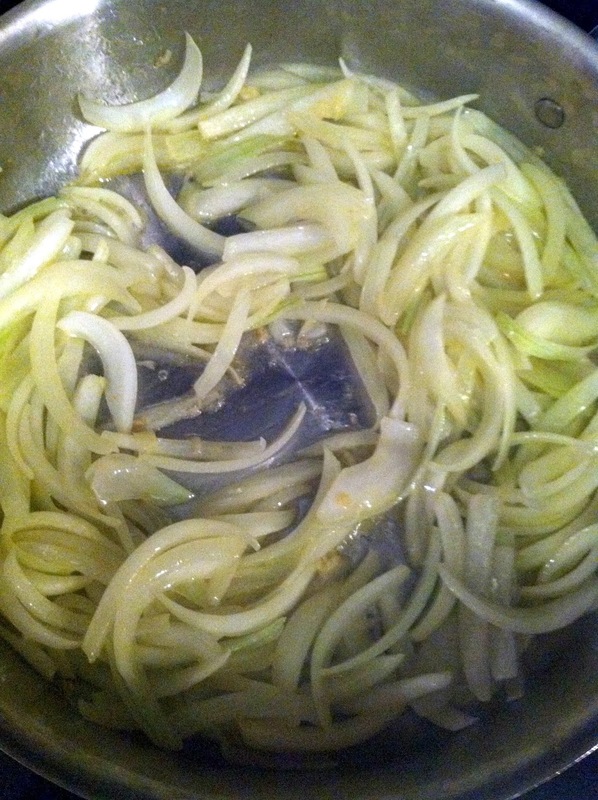 Add the chopped shallots and onion, cook until translucent, approx. 5-7 minutes. 2. Add the wine, stir everything together and keep stirring sporadically until the alcohol has burned off. 3. 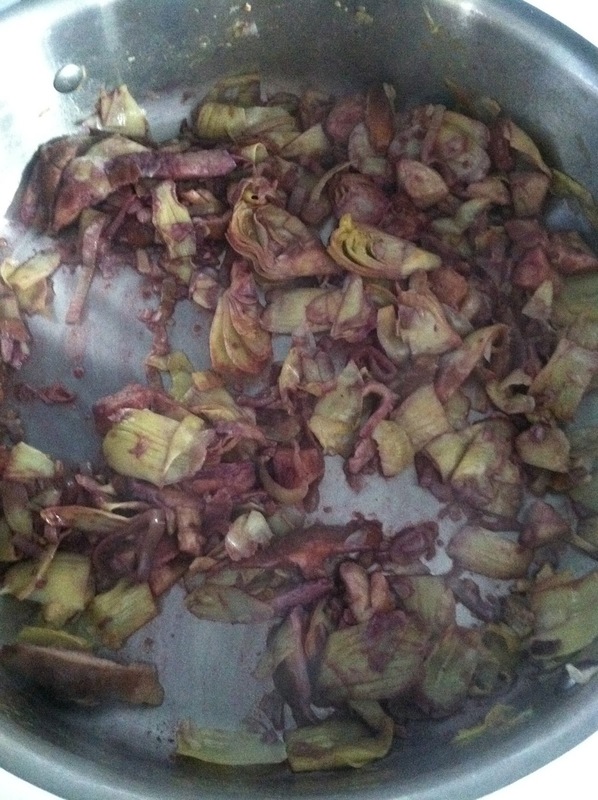 Add the artichokes (drained). 4. Add the chopped tomatoes and let them cook a bit until their skins are looser. 5. 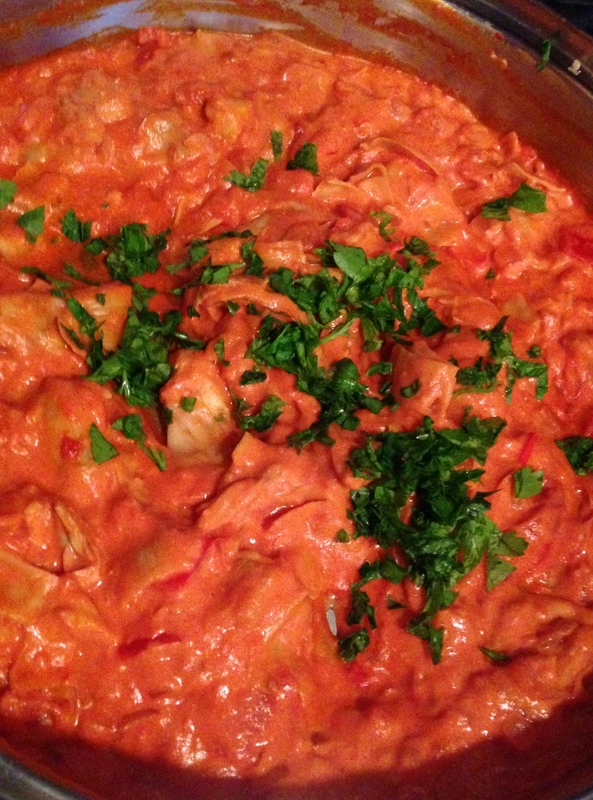 Add the can of chunky crushed tomatoes, then the cream, stir everything together. 6. 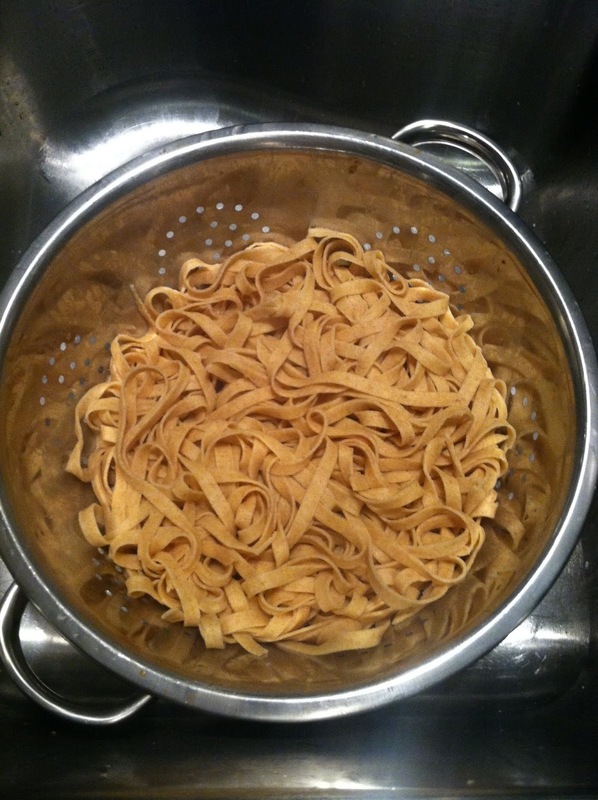 Get your pasta water up to boiling, then cook your pasta. Reserve about a cup of the pasta water before draining. 7. 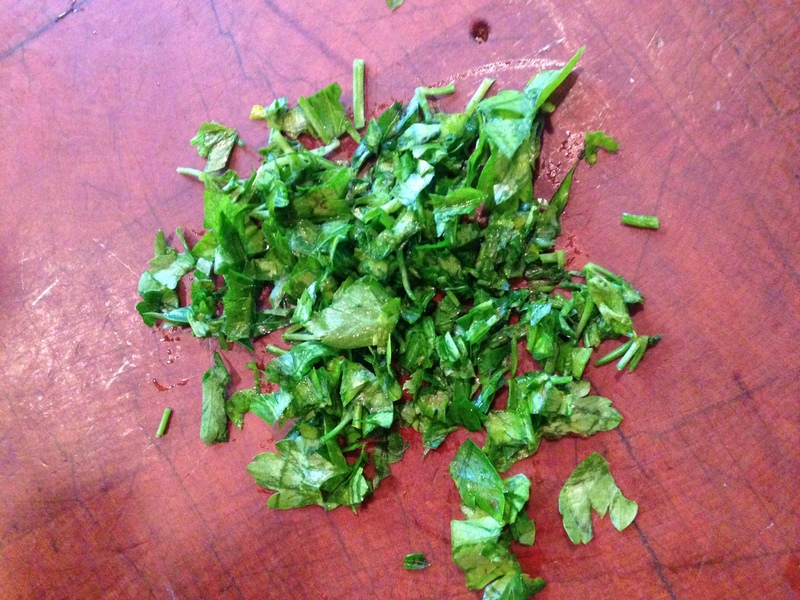 Stir in the handful of chopped parsley, about 1/3 c. freshly grated parmesan cheese, then taste and season as needed. Thin with the pasta water if needed. 8. Add the pasta to the saucepan, combine everything so the pasta is evenly coated. 9. Serve and enjoy (my mom got the “You’re the Best” plate, of course). 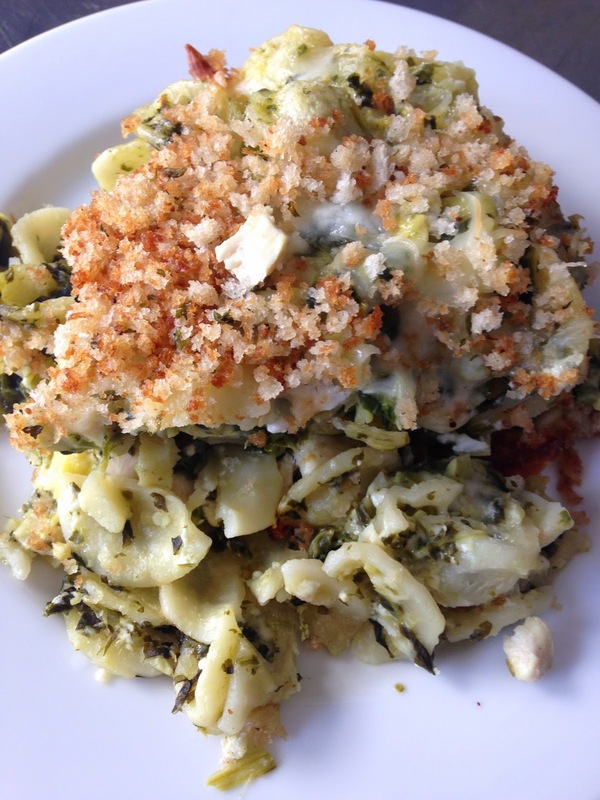 This entry was posted in dinner, family, February recipes, pasta, Uncategorized on January 23, 2015 by westyn. Seriously, I just can’t stop making things with squash this fall. 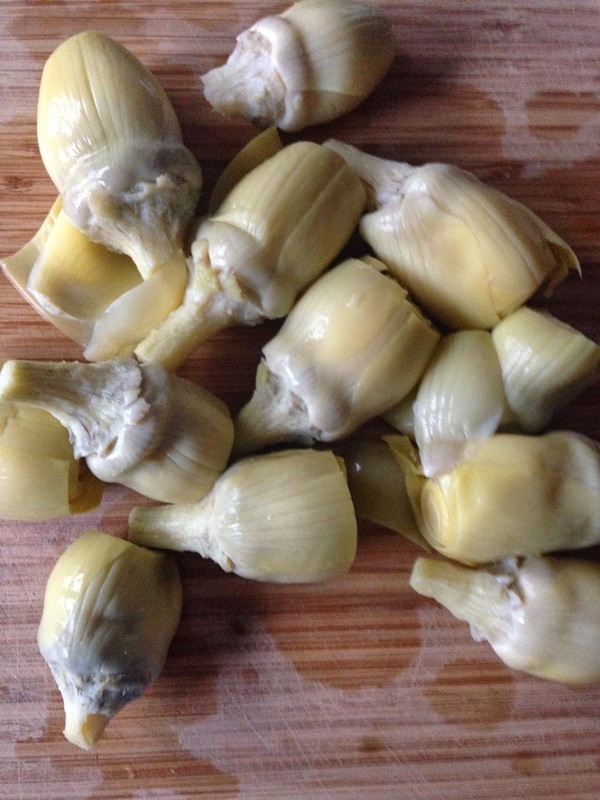 They’re so delicious, need almost nothing for flavor and can be used in a ton of different meals. This butternut squash pasta is a great way to get at least one serving of veggies in with your dinner, and it’s amazingly rich for how healthy it is. Plus: crispy sage. Mmmmmm. 1. Roast your butternut squash, then add the 2 peeled, oiled carrots to the tray about 30 minutes into the roasting process. When roasted, peel the squash & roughly chop it, and chop the roasted carrots. 2. Meanwhile, in a saucepan, melt 1 tbsp. butter over low heat. When it starts to brown and bubble, add the sage leaves. 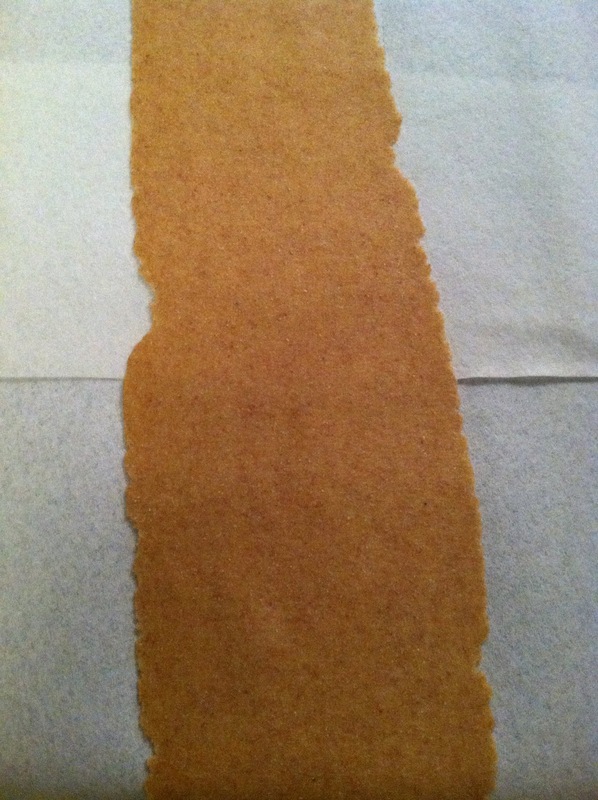 Let the leaves get crispy, then remove and set aside on a paper towel to drain. Sprinkle with a little kosher salt. 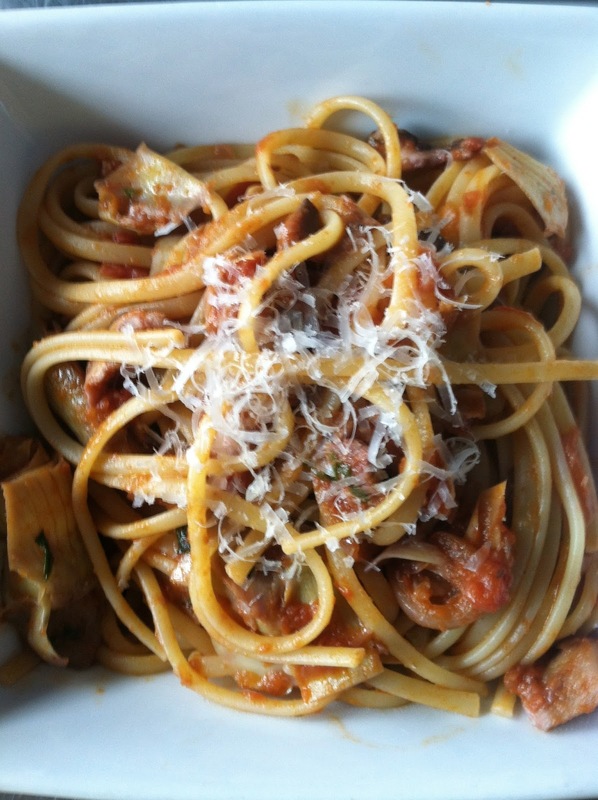 This entry was posted in butternut squash, fall, matchmaking, pasta, roasted butternut squash, sage on October 28, 2014 by westyn. There are certain things that just go together. Bacon and Cheddar. Sour cream and Onion. 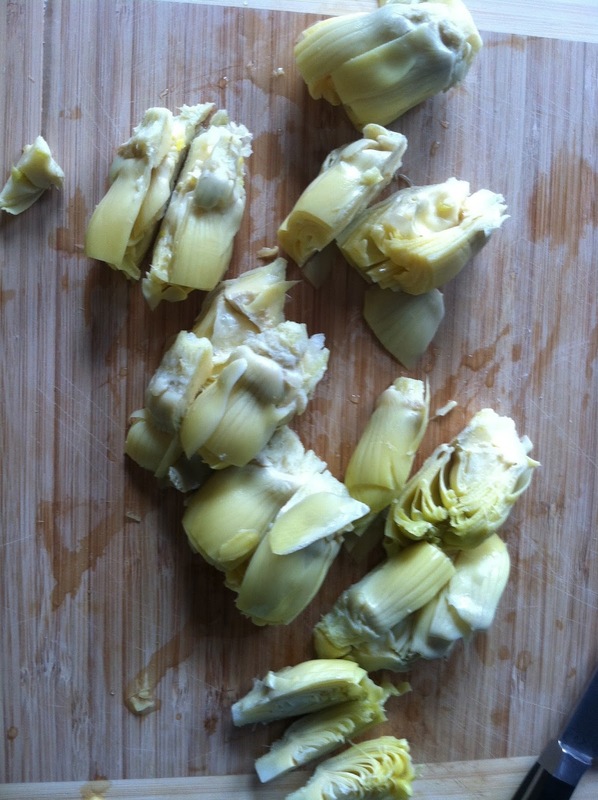 And of course, Spinach and Artichokes. What is it about that combo that’s so delicious?? I remember being a kid, and having it for the first time at probably the Ground Round or someplace like that, and feeling like my 8 year old culinary world had been blown wide open. 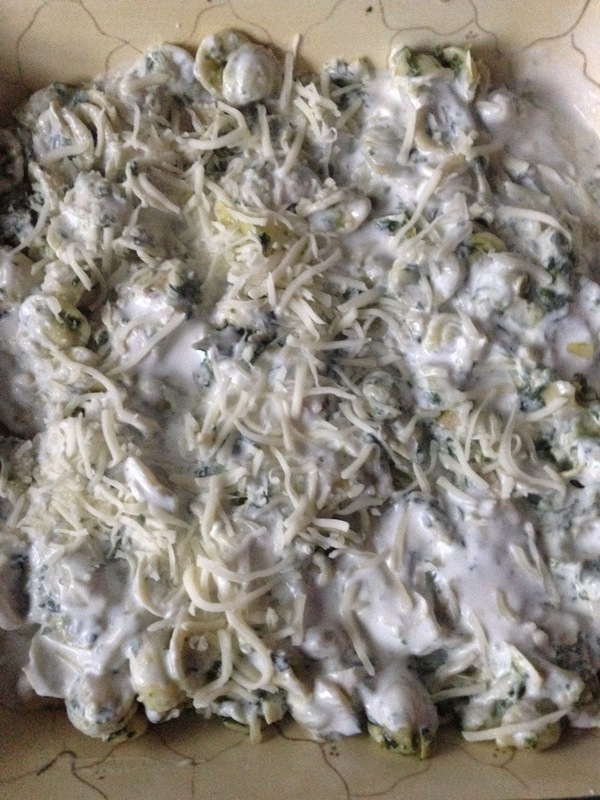 There are so many different recipes that I make now, but spinach and artichoke dip is still one of my go-to favorites for a crowd. This recipe lets you feel like you’re indulging in a classic appetizer for dinner, but actually lightens up everything by replacing the cream cheese with Greek yogurt and halving the sour cream, using about 1/2 of the cheese and adding protein-y chicken. Plus – pasta!!! This makes a ton, keeps really well, is able to be thrown together in 30 minutes, and will have your dinner companions full and happy in an hour and a half total, tops. 1. Set your oven to 375. 2. 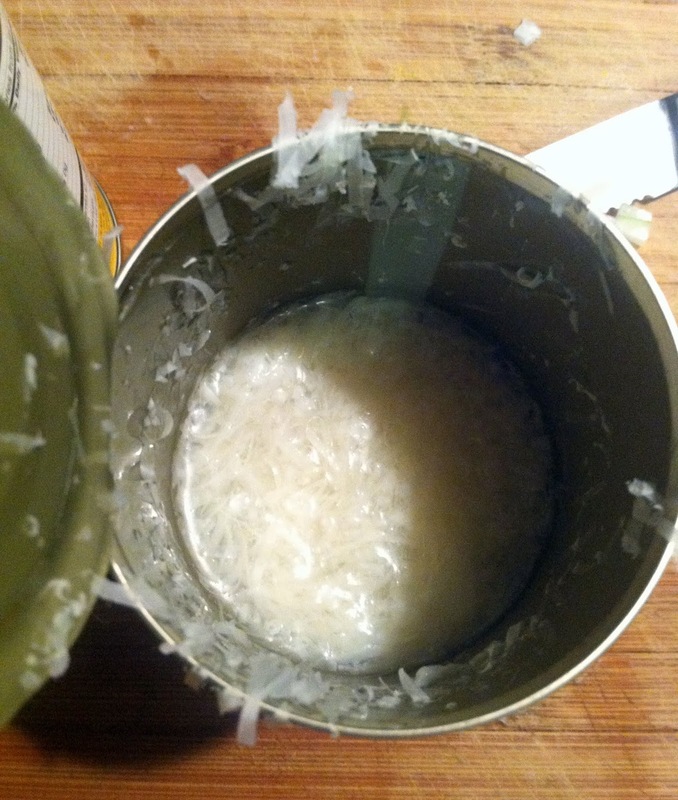 In a large pot, boil water, then salt it kind of heavily. Add pasta and cook until 2 minutes before its “al dente” stage. 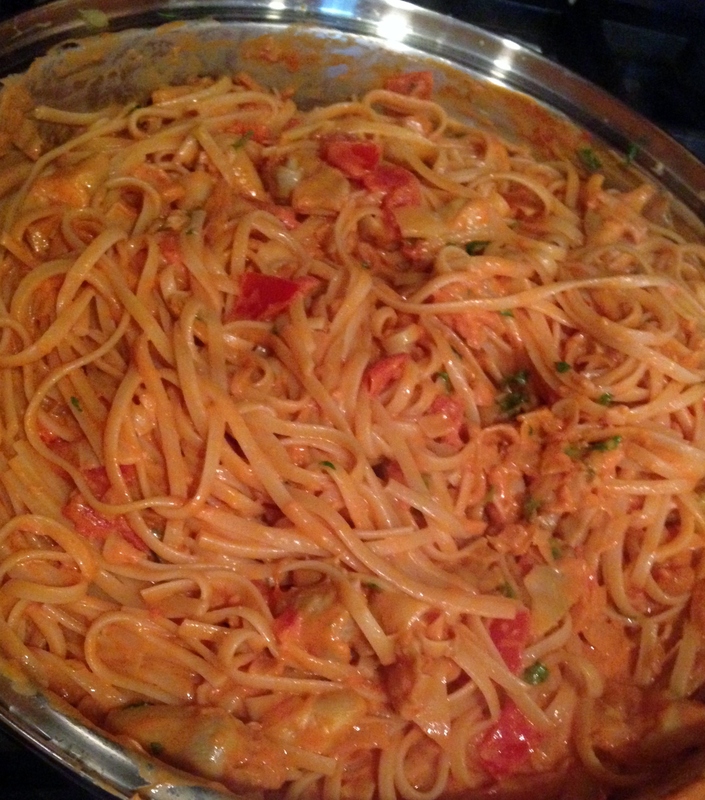 BEFORE YOU DRAIN IT, grab a cup of the pasta water out and set aside to let it cool. Drain the pasta. 3. In the same pan, heat 1 tbsp. EVOO over medium heat. 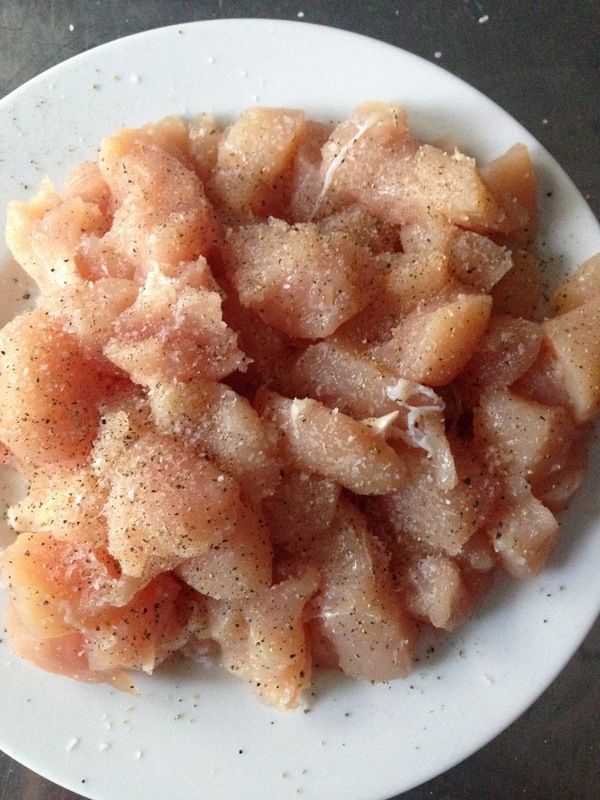 Add chopped chicken, which has been seasoned with kosher salt and pepper. 4. Cook until the chicken is almost all the way cooked through, stirring occasionally but letting it get a little browned. 5. While the chicken is cooking, heat up the creamed spinach in a microwave. 6. 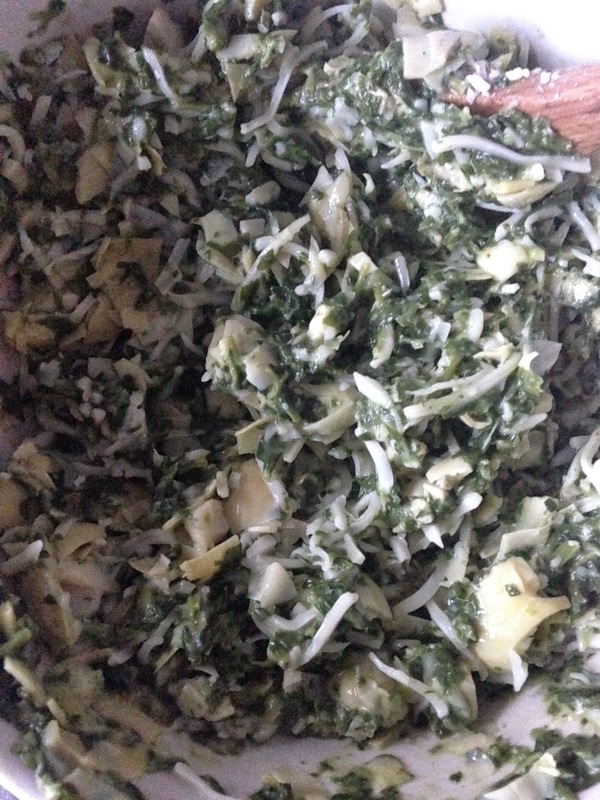 In a large bowl (use one bigger than you even expect will be big enough), combine the creamed spinach, 3/4 c. shredded mozzarella, and the chopped artichoke hearts. Add a little of the parmesan cheese and combine everything. 7. 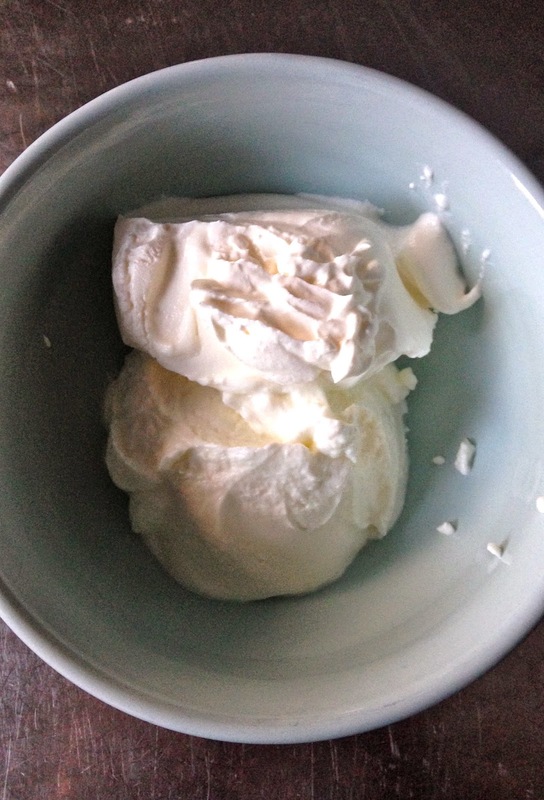 In a separate bowl, combine the greek yogurt, sour cream and a little more of the parmesan cheese. 8. Take the almost-fully cooked chicken off the stove and put the chicken on a plate. 9. 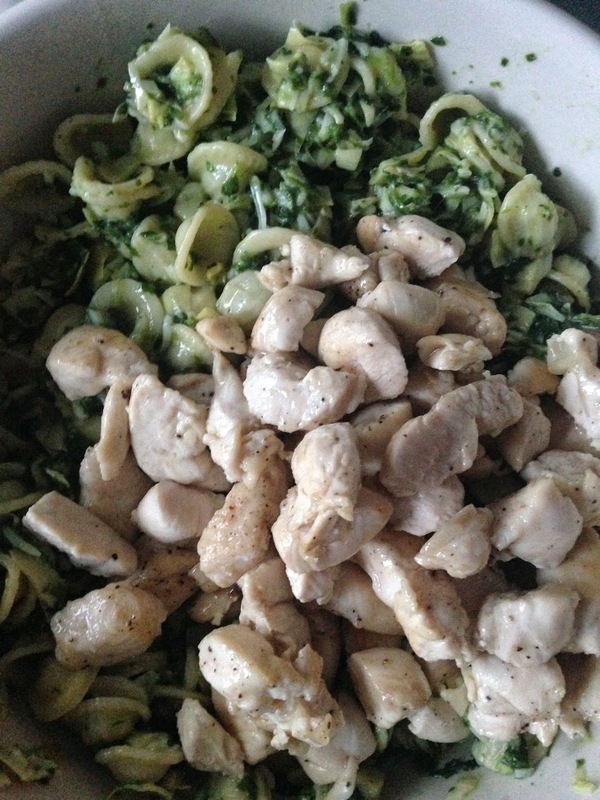 Add chicken and pasta to the spinach/artichoke mixture. Combine well. 10. Mix the greek yogurt/sour cream blend with the cooled pasta water, a little at a time, until the sauce is pretty thin but still has enough consistency to coat a spoon. 11.Spray a casserole dish with a little olive oil. 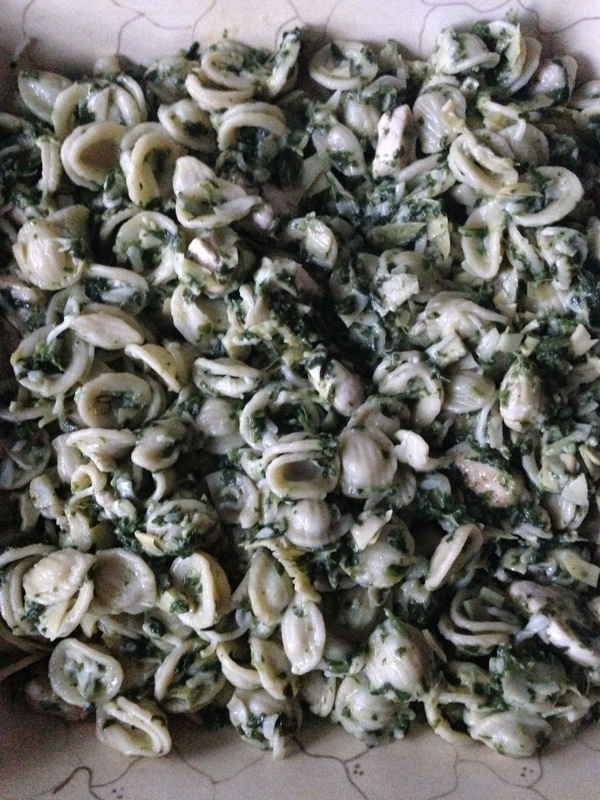 Add about half the chicken/pasta/spinach/artichoke mix. 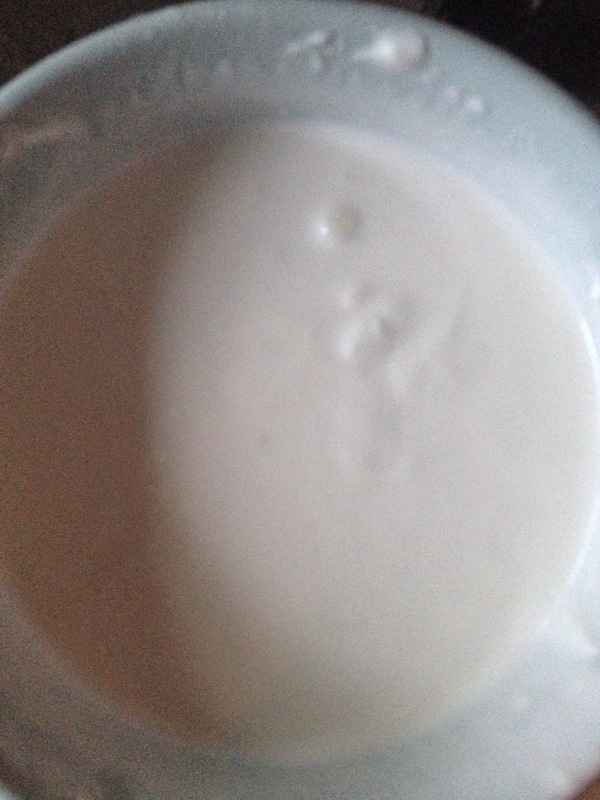 Top with 1/4 c. of the shredded mozzarella, then half of the greek yogurt/sour cream blend. 12. 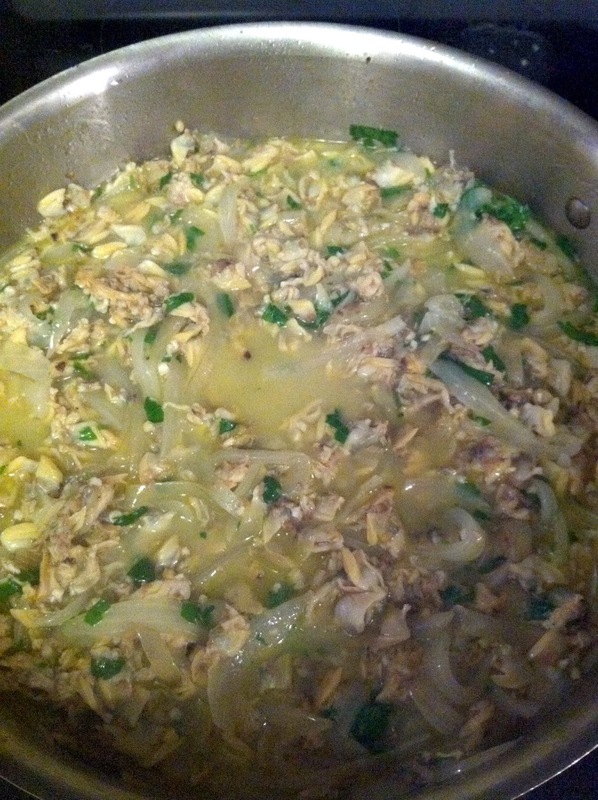 Add the rest of the chicken/pasta/spinach/artichoke mixture. Top with the rest of the greek yogurt/sour cream blend, then another 1/4- 1/2 c. of the shredded mozzarella and the rest of the shredded parm. 13. In a small pan, melt 1 tbsp. butter, then toast the panko breadcrumbs. 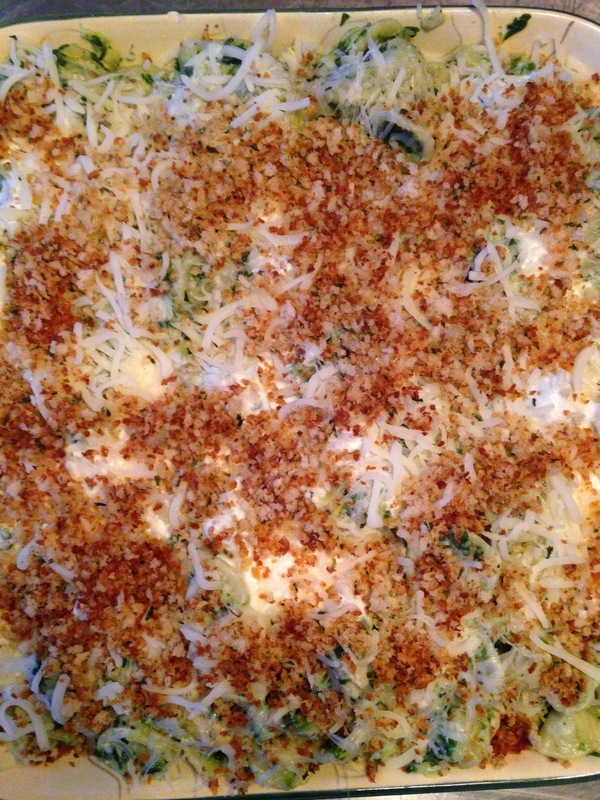 Top the casserole with the breadcrumbs. 14. Cover with aluminum foil, then bake for about 20 minutes. Uncover, put on the lowest rack, and cook for another 20 minutes – just make sure the chicken is cooked through. 15. Serve and feel like you got away with getting to eat a big bowl of healthy-ish spinach and artichoke dip for dinner! 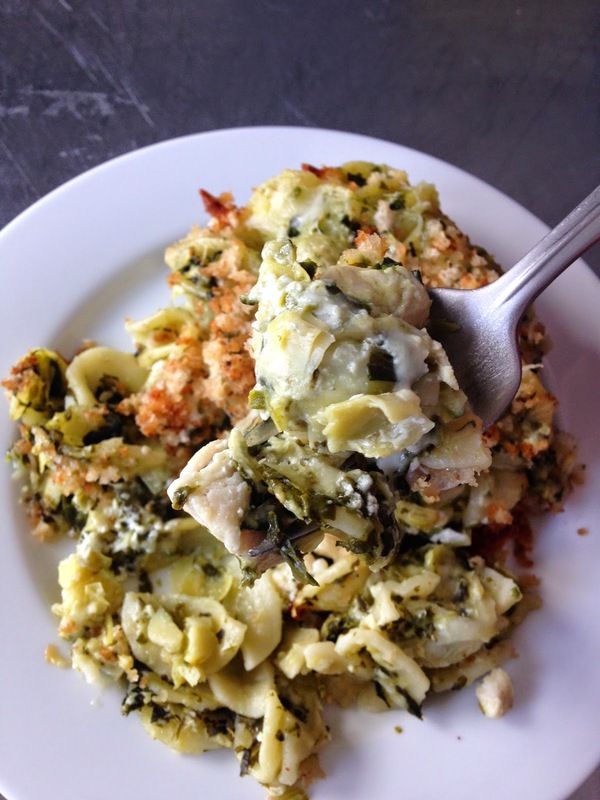 This entry was posted in artichoke hearts, chicken, comfort food, pasta, simple, spinach on August 8, 2014 by westyn. Who says that tomato sauce needs to be red? I love those cute little orange sungold tomatoes that are everywhere at this point in the summer. This is the simplest sauce – tomatoes, fresh thyme and basil, a homemade strained tomato sauce and a little onion, garlic & parmesan. There’s so little that goes into it, so make sure you use the freshest ingredients you can find. And, if you have leftovers of the sungolds, use them for this salad, which is basically summer in a bowl. 1. Boil water, salt it pretty heavily (this will be the only salt you use in this entire dish, so just keep that in mind). 2. In a large saucepan, melt butter and EVOO over medium heat. 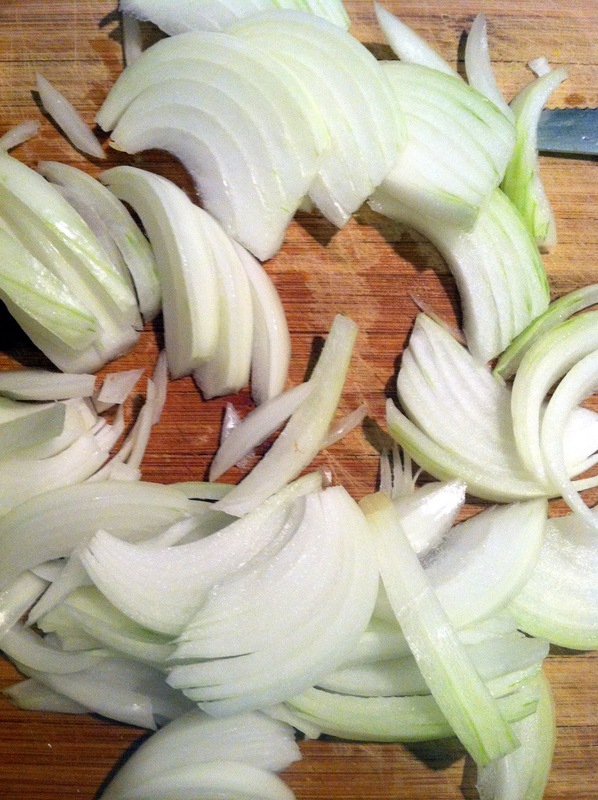 Add onion and cook until translucent, approx. 6-7 minutes. 3. 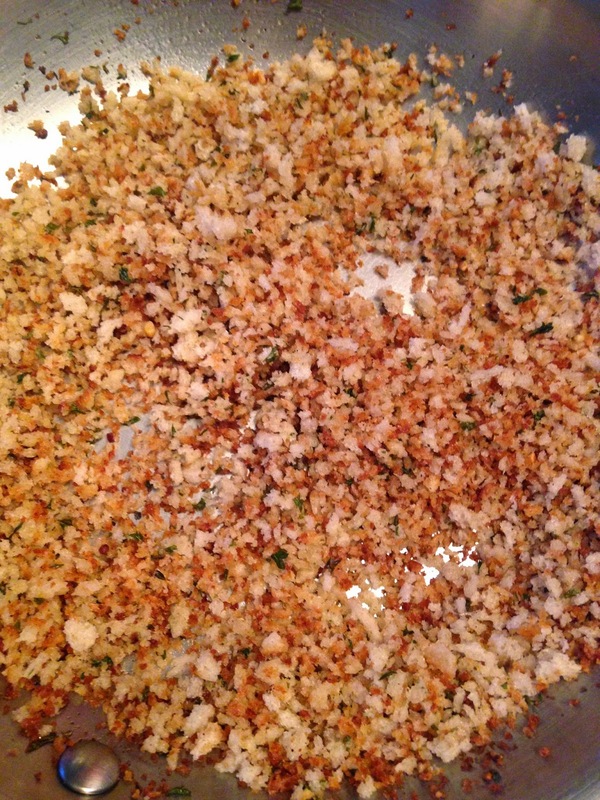 Add minced garlic, cook until fragrant, approx. 90 seconds. Add the fresh thyme and give everything a good stir. 4. Meanwhile, cook that pasta! 5. Take one pint of tomatoes, cut them in half, and throw them into a very fine strainer set over a bowl. With a spoon, crush the tomatoes against the strainer so the juice runs into the bowl below. Toss the skins. 6. Take the other pint of tomatoes, add to the saucepan, and turn the heat down to medium low. 7. Add the juice to the saucepan with the tomatoes. Stir until it starts to thicken a bit. If you want (I did), crush some of the whole tomatoes that are blistering with the back of the wooden spoon that you’re using to stir everything. 8. At this point, the pasta should be about 2 minutes away from al dente – this is perfect. 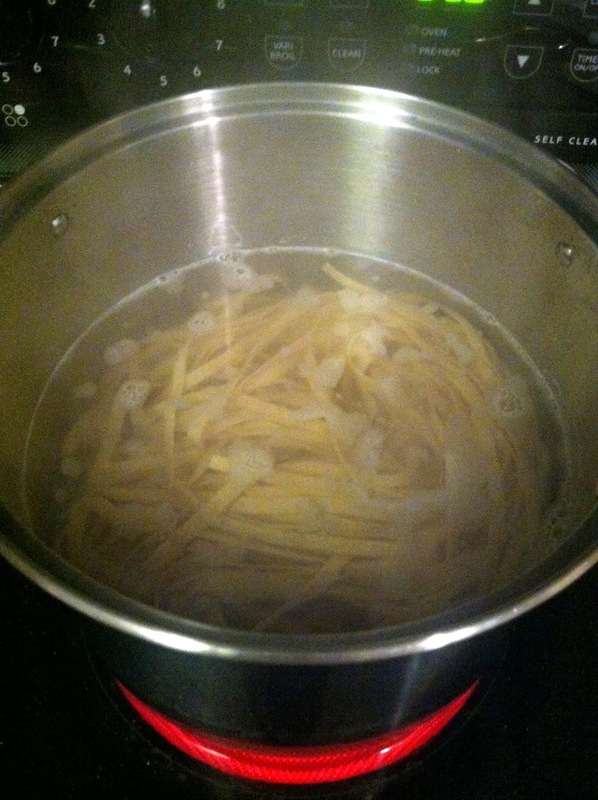 Grab about 2 cups of pasta water out of the boiling pot and set aside, then drain the pasta. 9. Add about half the reserved pasta water, stir to combine. 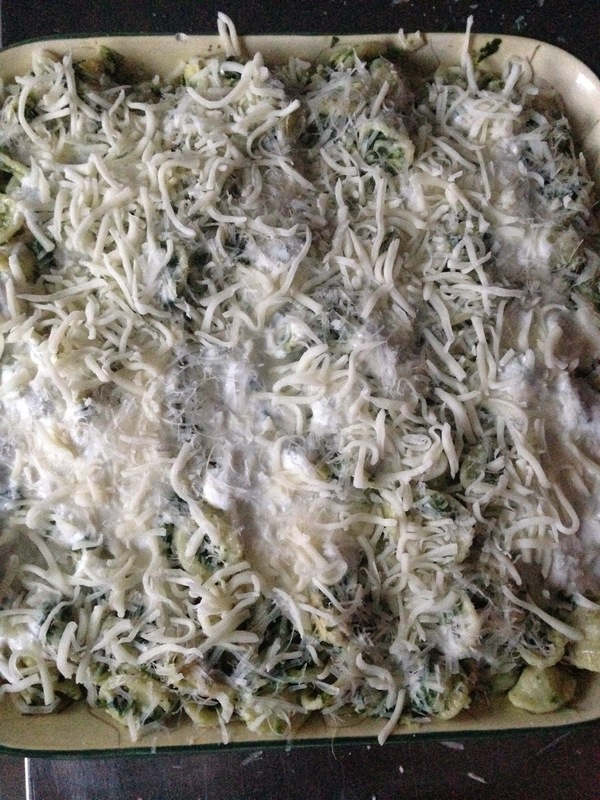 Add about half the grated cheese and mix. 10. 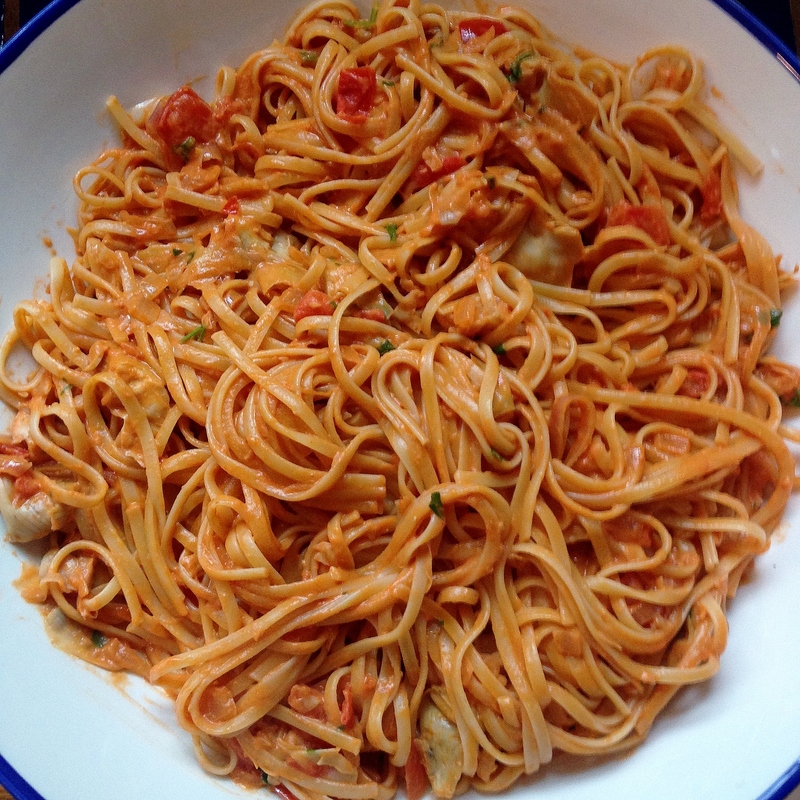 Add the pasta to the saucepan and use tongs to get it covered in the sungold tomato sauce. Let this all cook together about 2 minutes more. If sauce looks kind of thin, add the rest of the pasta water. Add the chiffonaded basil and stir. 11. 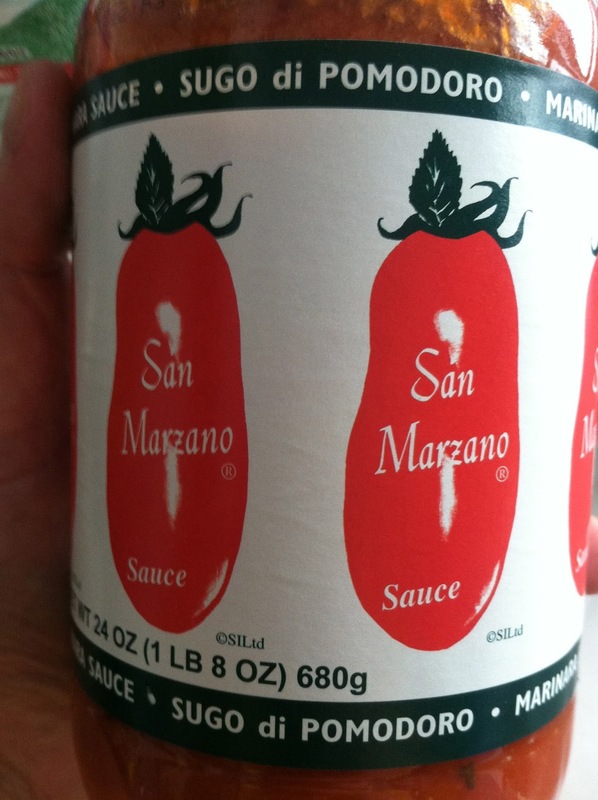 Remove saucepan from heat, and scoop this incredibly simple, delicious sauce into bowls. Observe how your dinner companion is eyeing the bowls “to make sure we both have equal”, give him an extra little scoop. Top with a little more grated parm and dig in. This was seriously delicious. 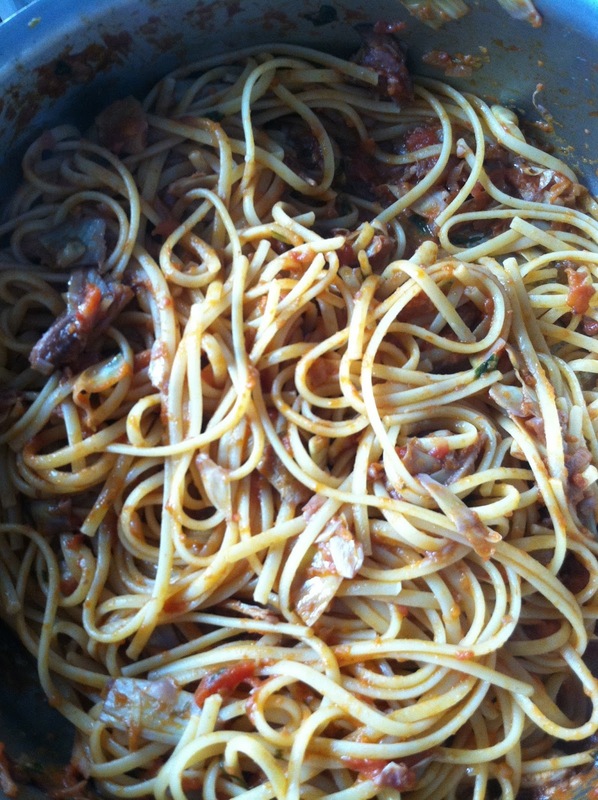 This entry was posted in main dishes, pasta, summer, sungold tomatoes on June 30, 2014 by westyn. So, let’s say you go to the grocery store and shop for the week, then get to the checkout aisle and only after the checkout girl starts ringing you up, realize that you’ve forgotten your wallet back at the office, and have to leave everything there. Then, let’s say you go back home and wing a recipe by putting cheese tortellini, lemon, shrimp and basil together, make a lemon-white wine sauce with a little butter and parmesan, then sit down for a really delicious meal that’ll knock your socks off and only leave you with one pot to clean. Who needs a wallet anyway. It’s Monday. This is a great recipe to start the week. 1. Cook tortellini in salted water in a french oven (I would cook absolutely everything in this), set aside. 2. In the pot that you used to cook the tortellini, melt butter, add EVOO & simmer with the lemon zest on low for 5 minutes. 3. 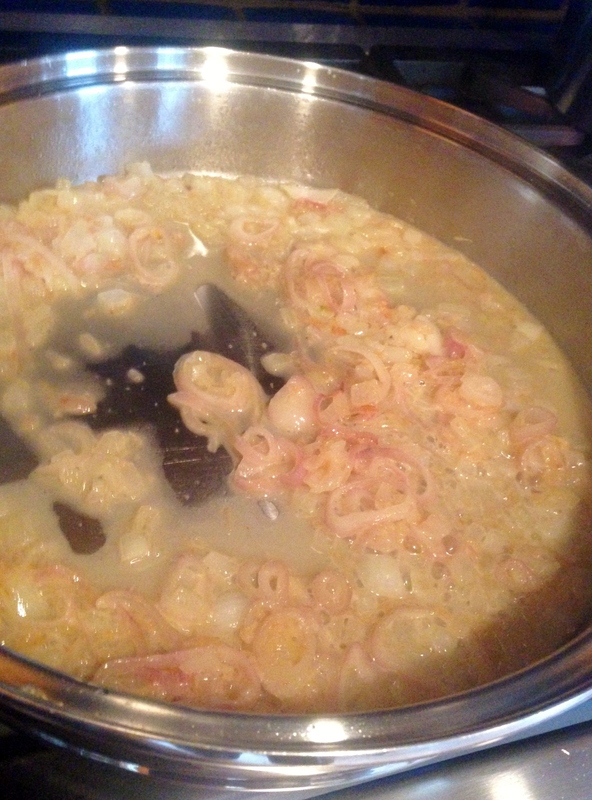 Add chopped garlic and shrimp, cook until pink (2-3 mins). 4. To this mix, add juice of 1.5 lemons, and 1/4 c white wine, then let infuse for another 2 minutes on low. 5. I removed the shrimp at this point and put them on a plate to rest, so they didn’t overcook, then cooked down the wine/lemon/butter/garlic sauce a little bit. When the shrimp cooled, I chopped it up into bite-size pieces. 6. When sauce is mildly reduced and the alcohol has burned off the wine, add the shrimp & the juice collected on the plate, tortellini (dry – don’t add EVOO or anything, or it won’t stick! 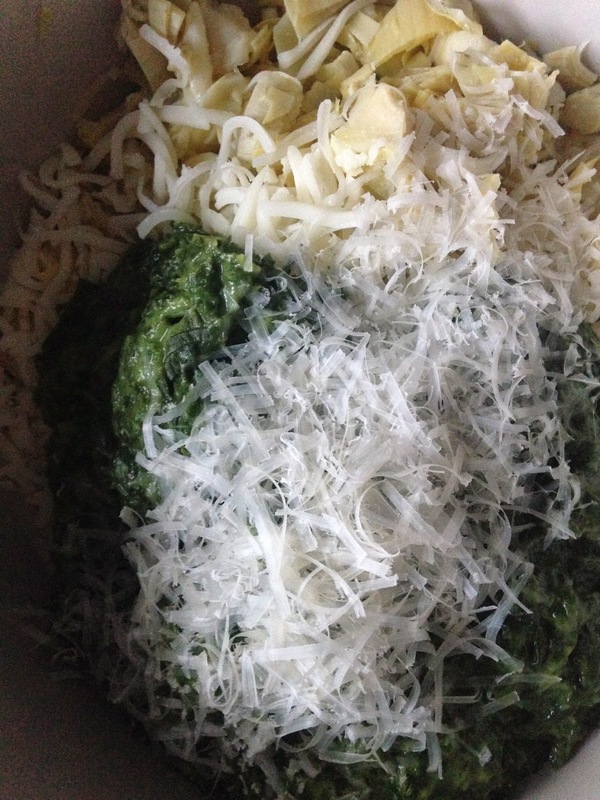 ), parm, basil, and give everything a big stir. 7. Remove from heat, cover, let sit to warm up the tortellini and shrimp again (get a salad ready or something – we had it with a green salad topped with my favorite avocado-cilantro dressing). 8. Right before serving, put a little slice of butter in, along with half a lemon, juiced, and a little more grated parm. Taste and adjust seasonings, and enjoy. 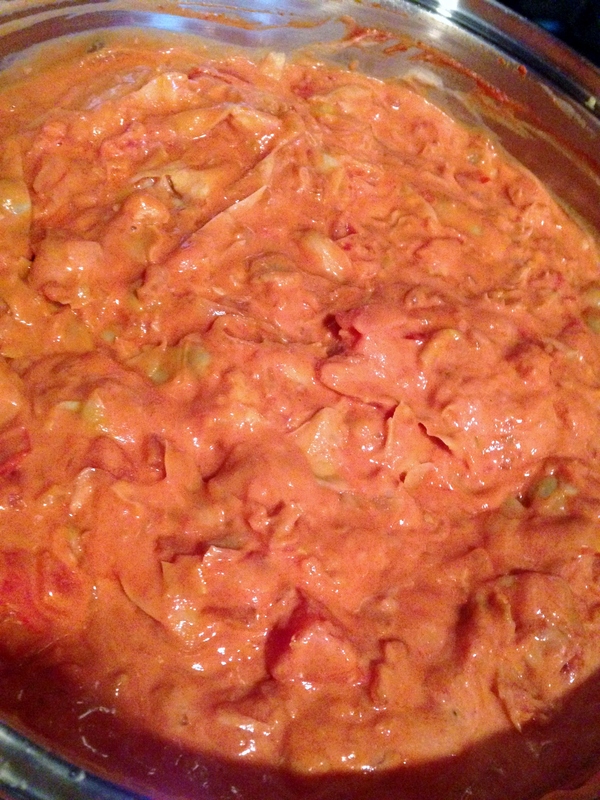 This entry was posted in one-pot, pasta, shrimp, simple, tortellini, vegetarian on June 10, 2014 by westyn. What’s better than being able to cook a great vodka cream sauce while trapped inside the house in a snowstorm? Cooking a great vodka cream sauce while trapped inside the house in a snowstorm, with your sister. Two winters ago Collyn was visiting me and we had a huge snowstorm and couldn’t leave the house. We were craving comfort food and – amazingly – had everything in the fridge that we needed to make this. Even the half cup of Kettel One (which has never been put to such delicious use). Eating pasta is always better when your sister is snuggled on the couch next to you with a bowl of her own. 1. 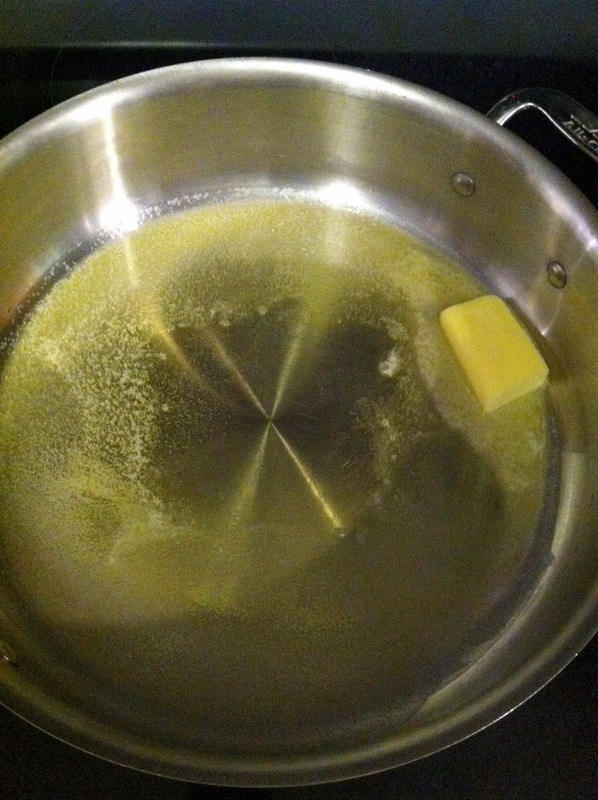 In a large saucepan, melt the butter and EVOO over medium heat. 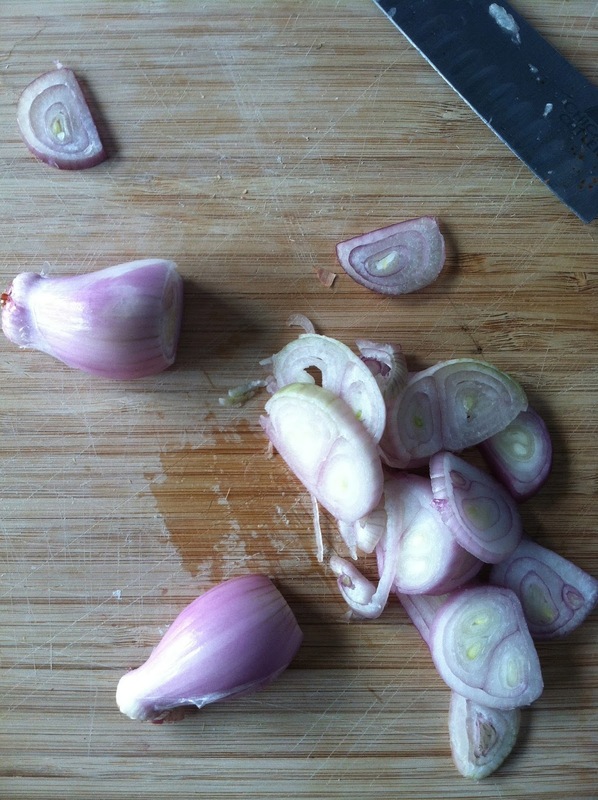 When combined, add chopped garlic and saute until fragrant, approx. 90 seconds. 2. 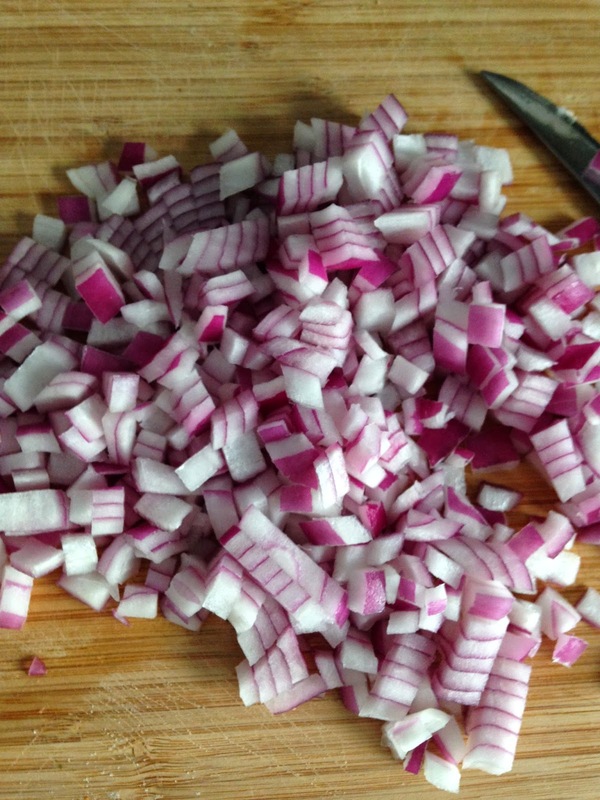 Add chopped red onion – I know people usually use white onions, but I actually like how the red onion sort of loses its color and gains a sweetness. You really want to make sure these are sauteed enough though…they’ll continue to soften as you cook, but make sure they’re pretty much already there before you start adding the other stuff. 3. Add the vodka, then cook it down, about 4-6 minutes. 4. 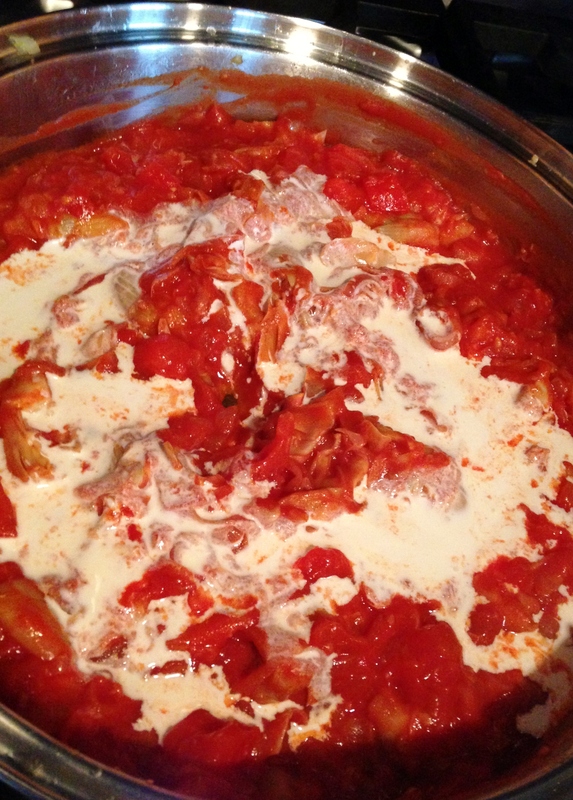 Add the tomato sauce, then heavy cream. Use the correct amounts here – I’ve tried to use a little bit more of one thing, a little bit less of another, but that gives me some derivative of tomato soup, which I’ll leave to The Kitchen. 5. Turn the heat down to low and let this simmer while you make the pasta. 6. Salt the pasta water pretty heavily – this may be the only seasoning you need for this, which is pretty incredible. Cook the pasta. 7. Throw a bunch of freshly grated parmesan cheese and the chiffonaded basil into the sauce when pasta is about halfway cooked, then give it a good stir. 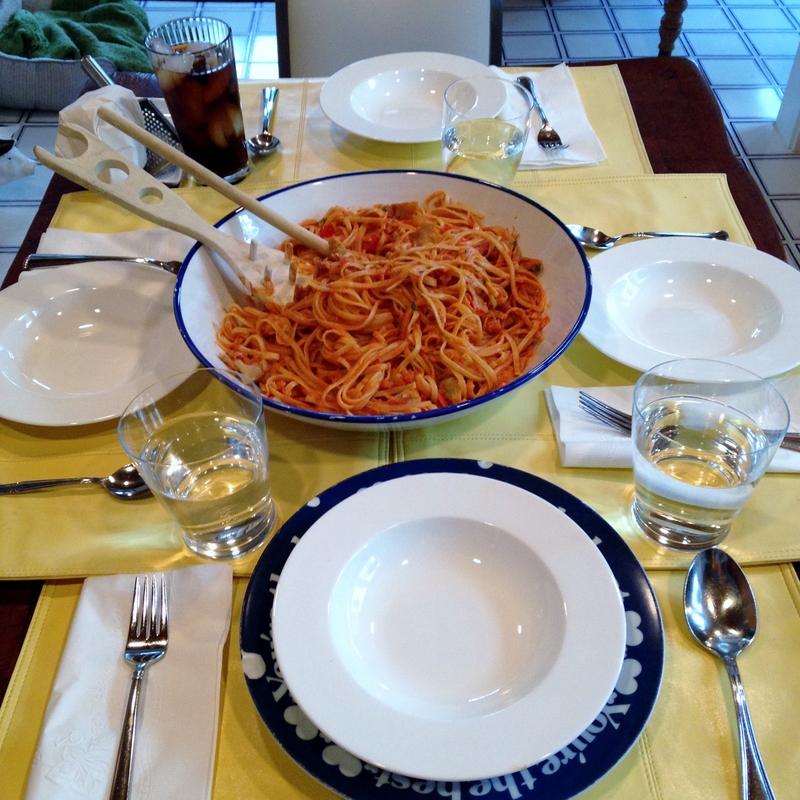 This entry was posted in comfort food, deliciousness, family, love, pasta, simple on May 17, 2014 by westyn. 1. Over medium heat, melt the butter and the EVOO together. Add the minced garlic and stir until fragrant, approx. 60 seconds. 3. 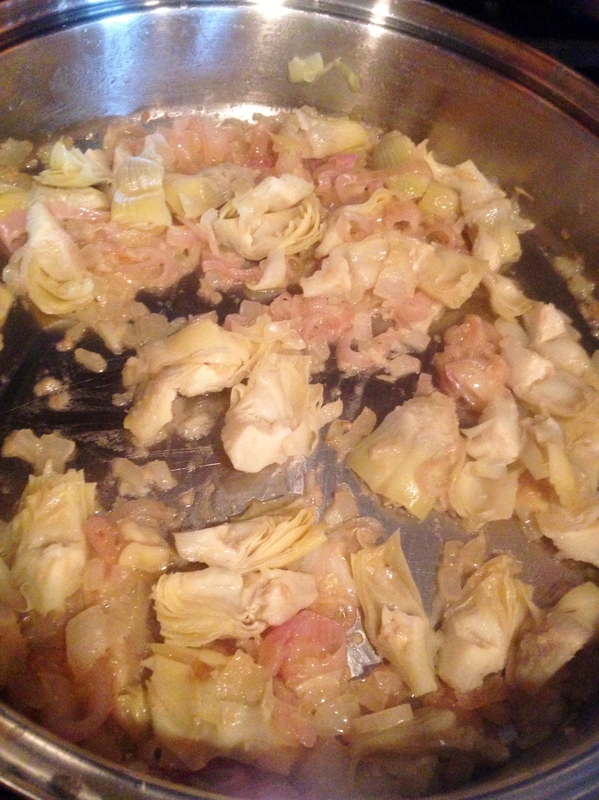 Add the artichoke hearts, add salt & pepper, and cook another 5 minutes or until everything seems to soften, not stick, to the bottom of the pan. 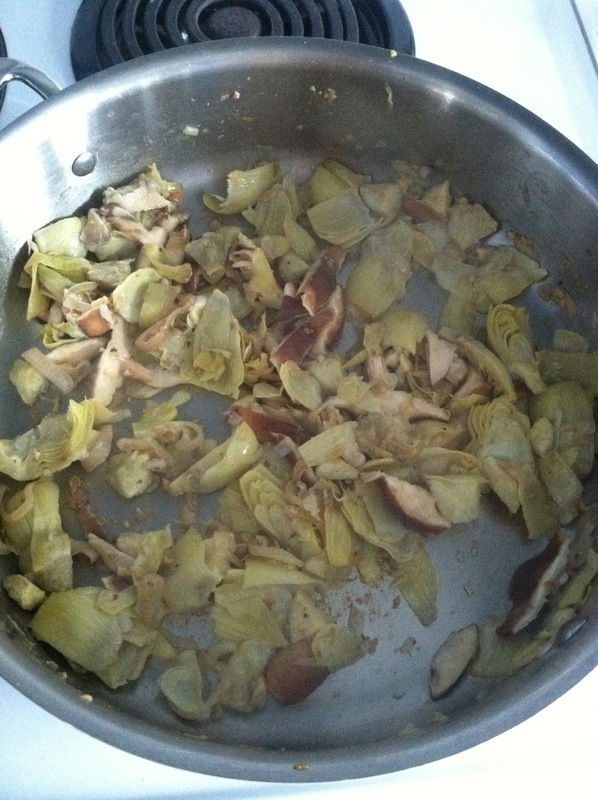 Add the sliced shiitakes. 4. Add 1/4 C. red wine, stir everything together. 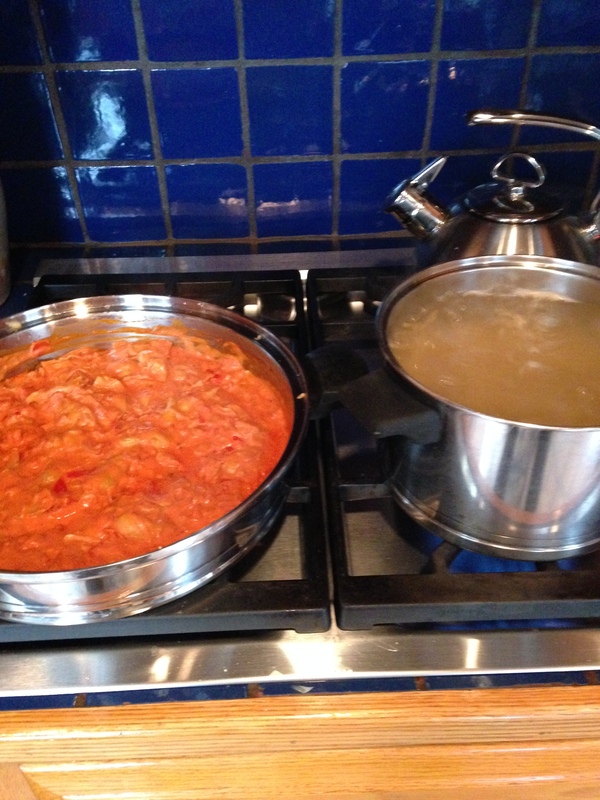 Let cook approx 5 minutes – you really want to let the alcohol burn off. 5. 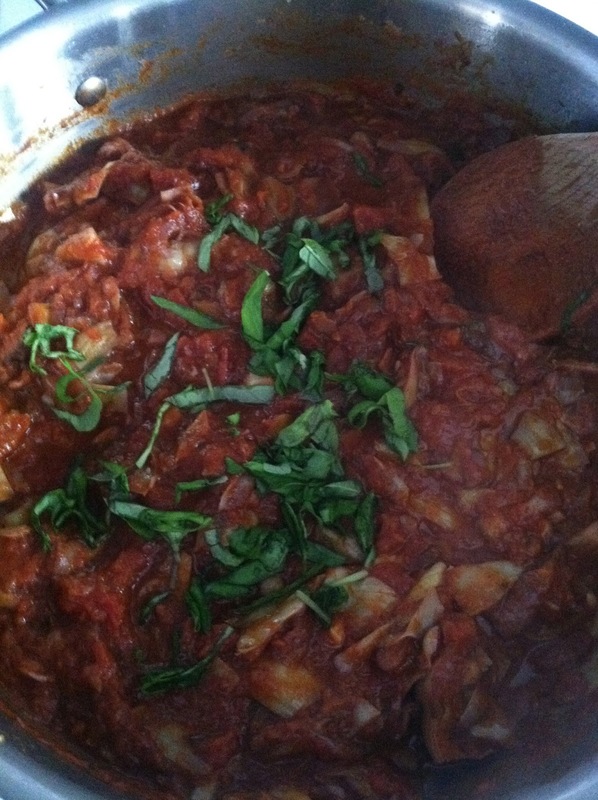 Pour in the tomato sauce, mix everything together really well, and lower heat to medium low. 6. Bring a pot of water to boil. Add pasta and cook according to directions. Drain, but don’t rinse! Set aside. 7. Taste sauce, then add the parm cheese. Taste again, then season as needed. Add the basil, stir to combine. 8. 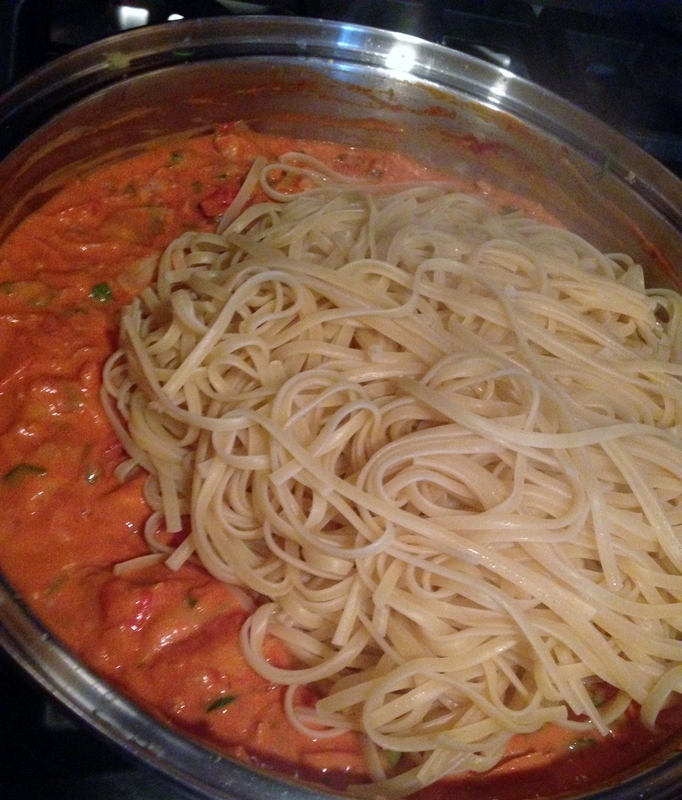 Dump the pasta into the saucepan with the sauce, mix everything up really well. Top with another little bit of parm and enjoy! 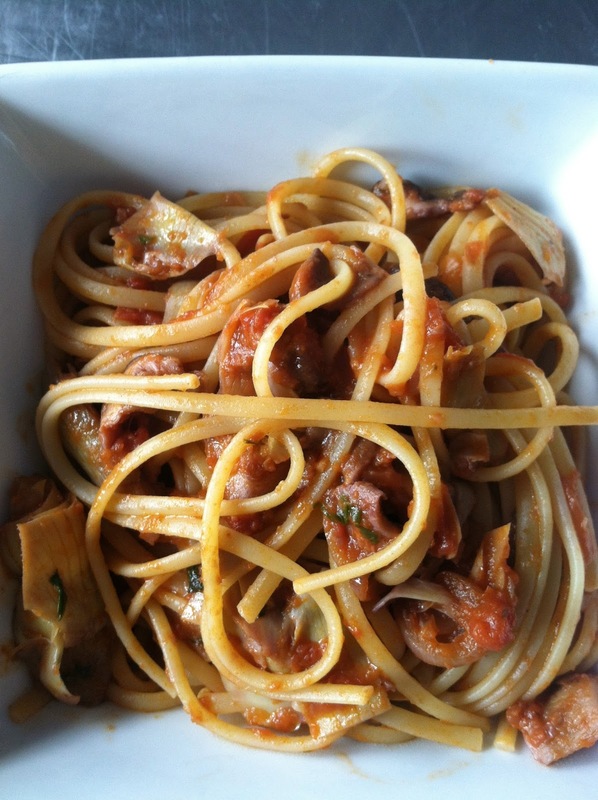 This entry was posted in artichoke hearts, love, pasta, quick, shiitake mushrooms on August 12, 2013 by westyn. This recipe has been my simplest go-to meal to cook for company since I got my first apartment. It’s comfort food that seems fancier than it really is, it takes almost no time at all to throw together (minus the simmering), and if you make it with fresh pasta (please do) it’ll be immediately added to the rotation. I have never known anyone who didn’t completely love this recipe. Thanks Mom! 1. 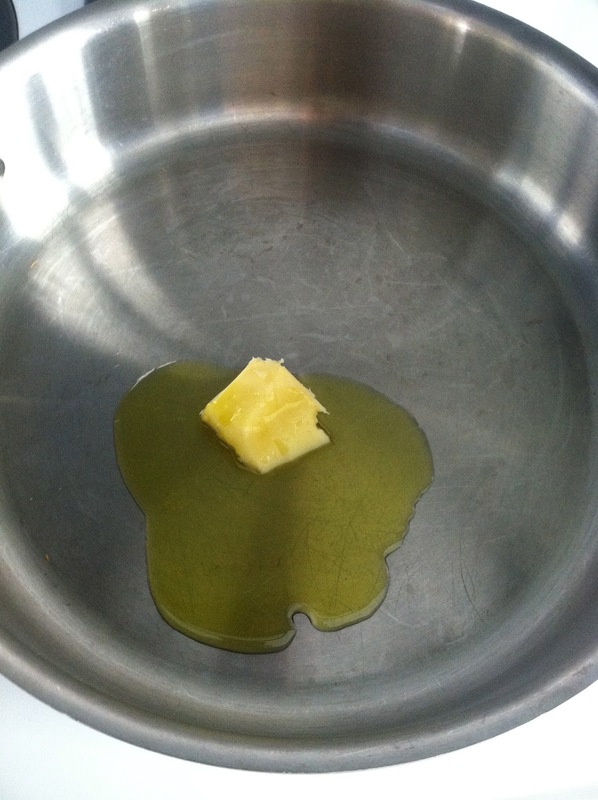 In a large pan, melt the butter and EVOO over medium heat until combined. Add the garlic and stir until fragrant, approx. 60 seconds. 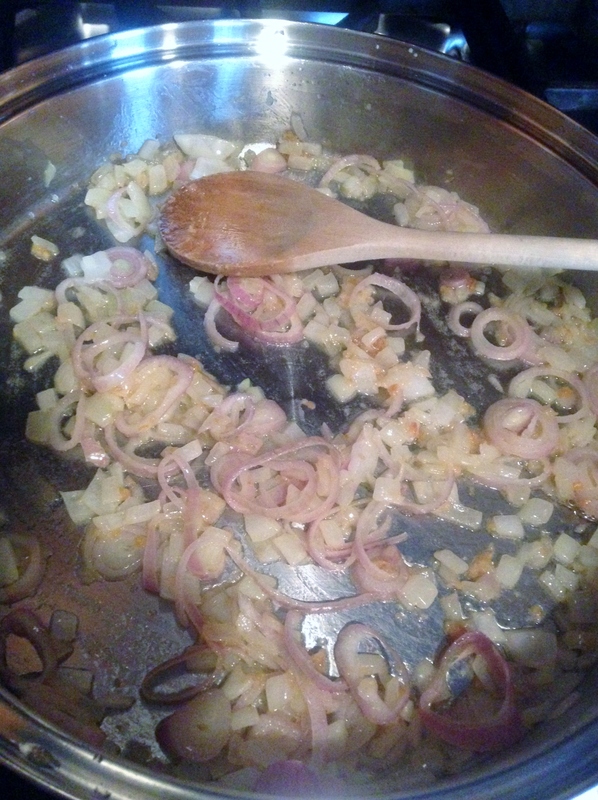 Add the onions and saute until soft, approx. 5-7 minutes. 2. Add the wine and let the alcohol burn off, approx. 3-5 minutes. 3. 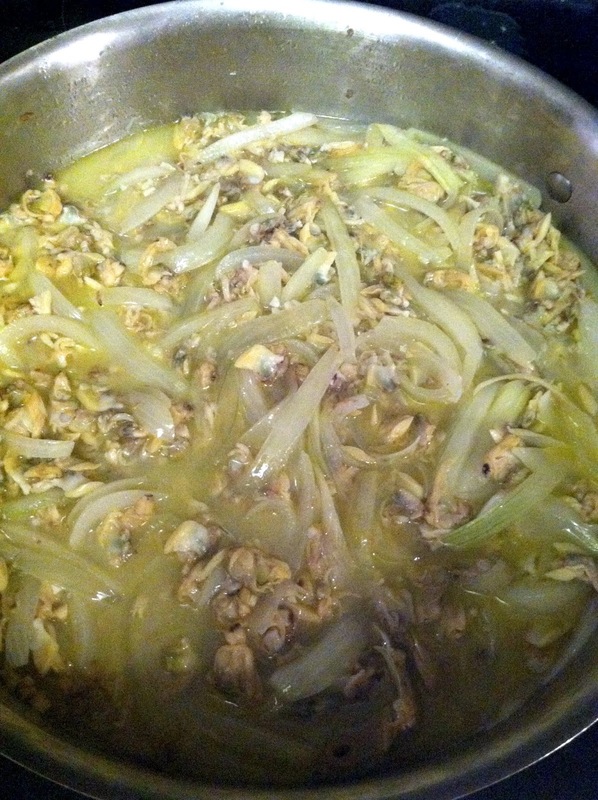 Add juice of 1 can and all the baby clams. Take 1 can of juice and discard. 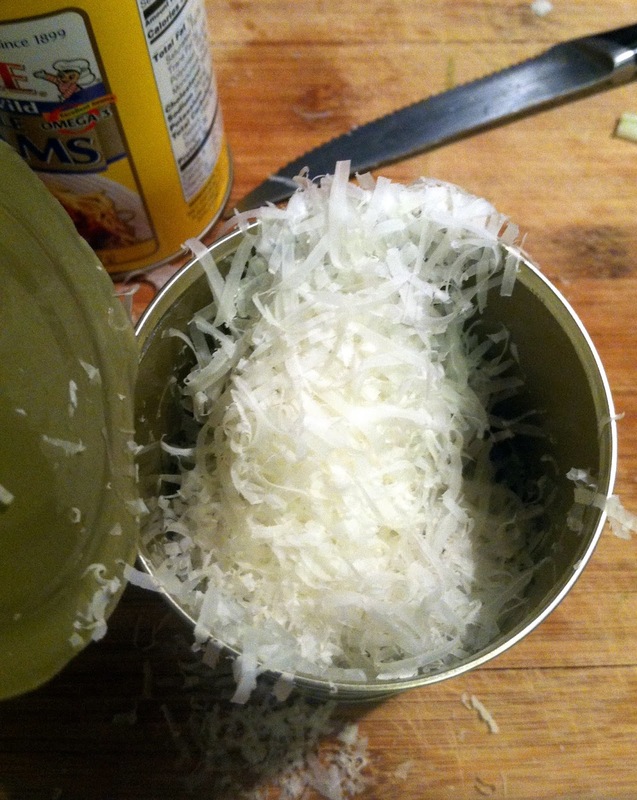 In the remaining can with the juice, add 1/4 c. grated parm, combine, and add to the pan. 3. Stir to combine, then turn heat down to low. Cover and simmer for about an hour, stirring every now and then. 4. 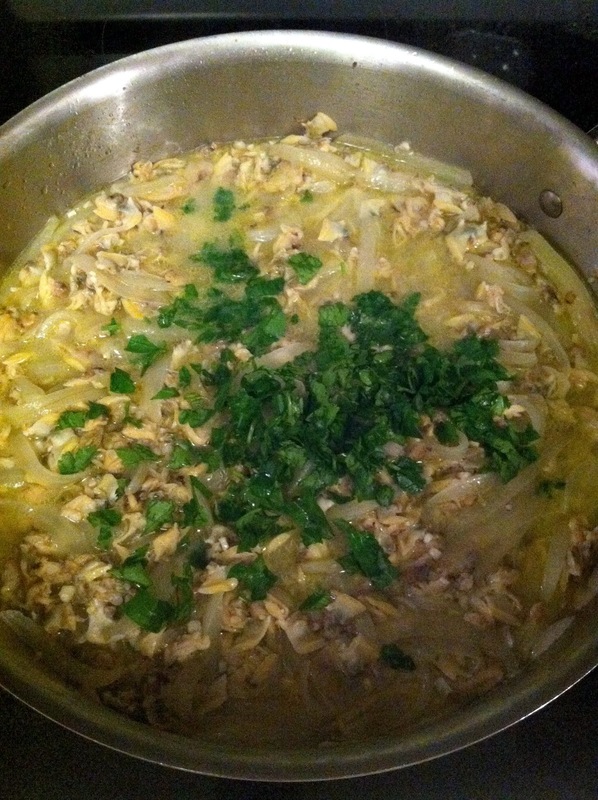 At the very end, throw in the chopped parsley and stir to combine. Cook the pasta, then top with the white clam sauce. There will be quite a bit of juice, which is delicious, so keep the pasta separate so it doesn’t soak it up (if you’re going to have leftovers). 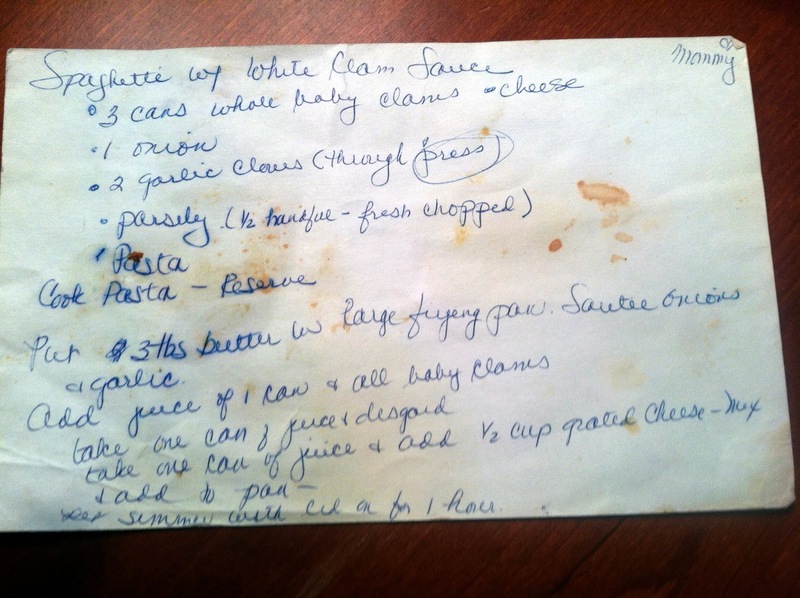 That’s a well-used recipe card from my Mom, right there! 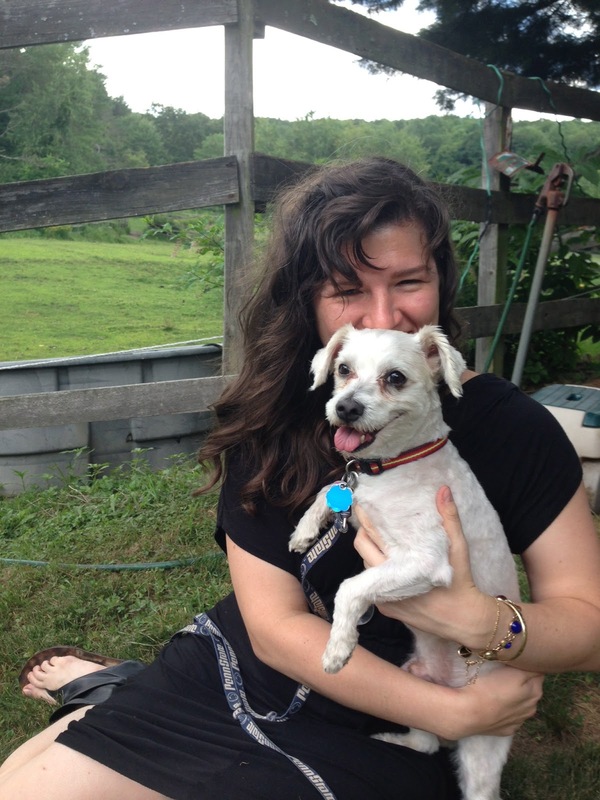 In other news, I am super psyched for a weekend yoga workshop with the amazing Pradeep at Balance Yoga despite this snowstorm that’s meant to be bombarding the Northeast this weekend. Also, snowstorm “Nemo”? Seriously?? 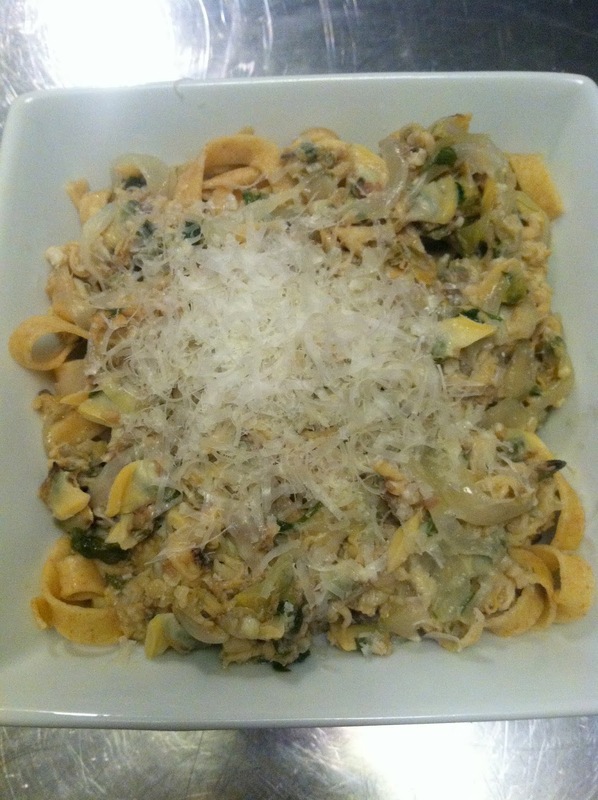 This entry was posted in balance yoga, dinner, February recipes, lunch, pasta, pradeep teotia, snowstorm Nemo, vegetarian, white clam sauce on February 8, 2013 by westyn. 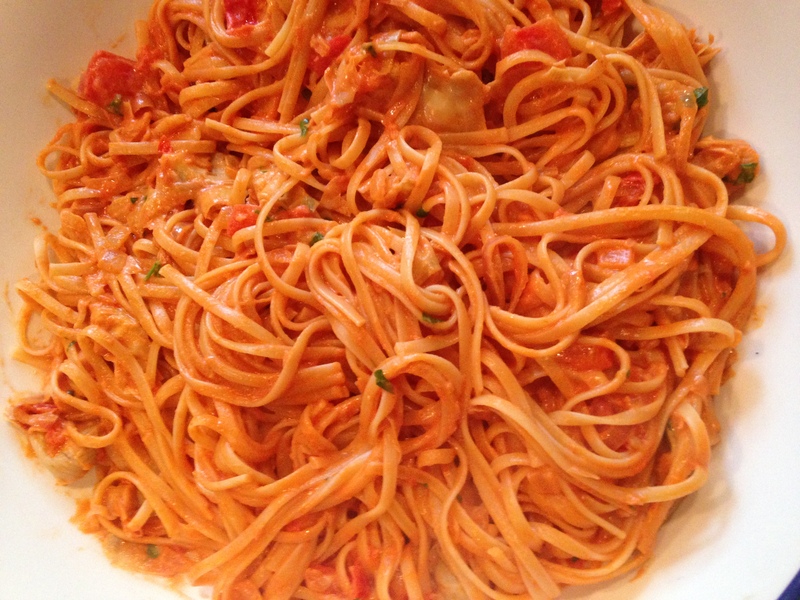 There are few things I love more than pasta. In an effort to eat more healthily, though, over the last year or two I’ve tried to limit myself to eating pasta in one of two instances: 1. at really great restaurants, and 2. when I make it myself. I got an Imperia Home Pasta Machine for Christmas two years ago, and while the process takes a little while, the end result is SO MUCH BETTER than any pasta you’ll ever find in a box. The mixing of the dough was a production until we realized that the dough hook on our KitchenAid mixer would take care of this in no time flat. You need two ingredients for this (and a little olive oil). Ready? 1. The basic mix goes like this: for every 3/4 C. flour, add an egg. I used a combination of Semolina Flour and Whole Wheat flour this time, but honestly, all-purpose flour alone is probably your best bet. If you’re using the KitchenAid mixer, beat the eggs lightly and then add the flour little by little with the dough hook running. 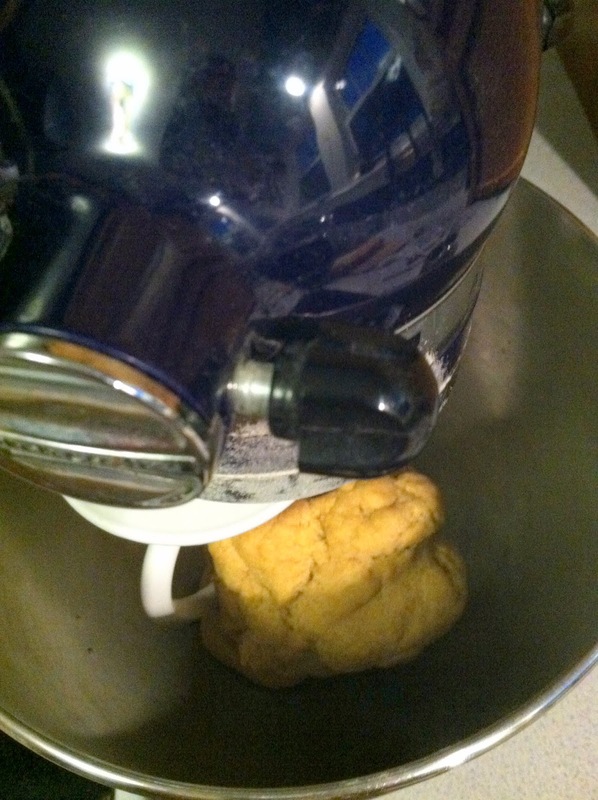 Then let the dough hook work its magic for approx. 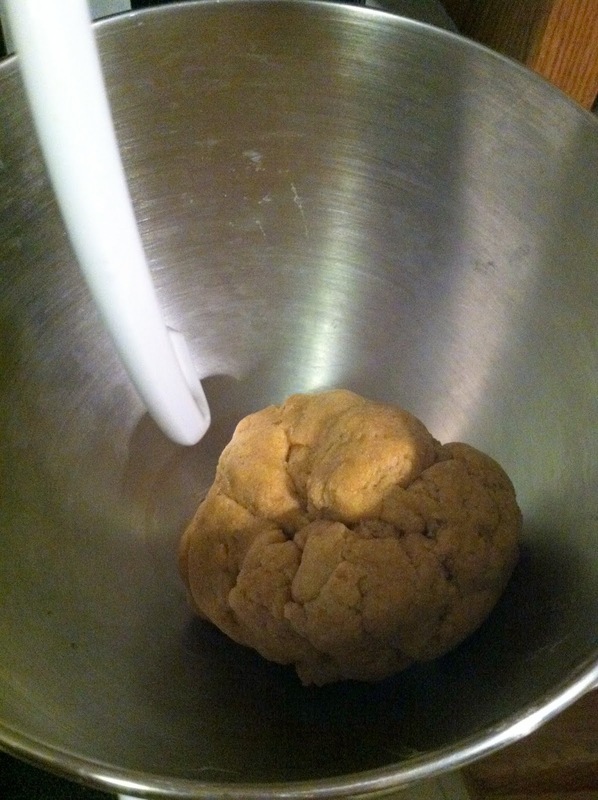 5 minutes, and you’ll come back to a ball of dough. 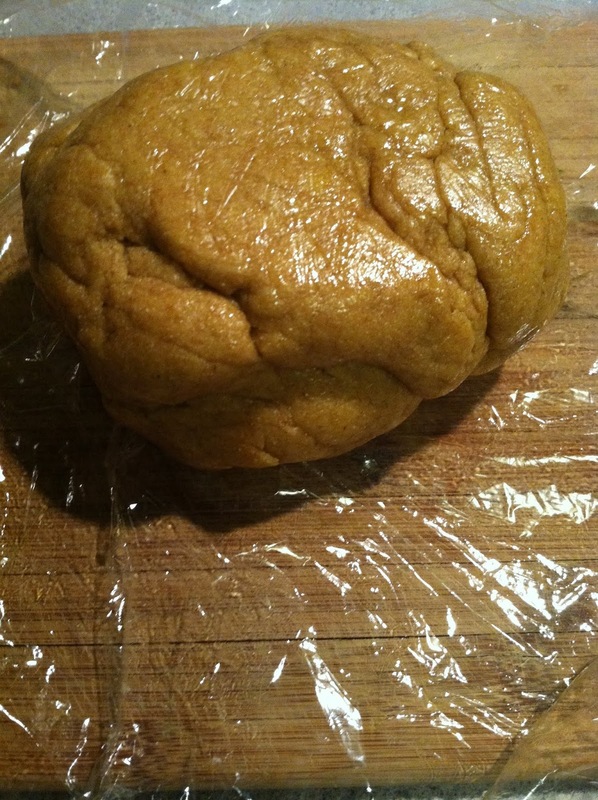 It should pull cleanly off the dough hook – if it’s too sticky, add a little flour, too dry, add a little olive oil and mix some more. — If you don’t have a KitchenAid Mixer, form a little volcano shape out of the flour, and crack the eggs into the volcano’s “crater”. 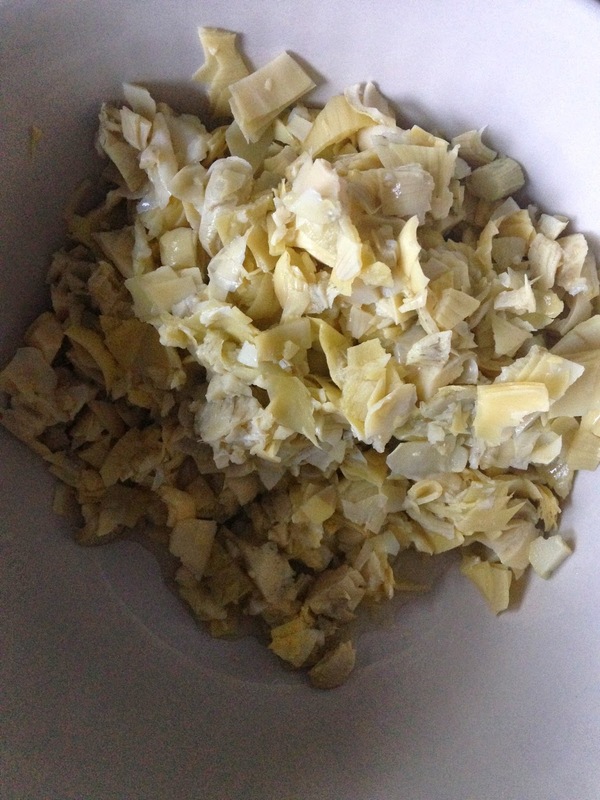 Working from the outside in, gently combine the eggs and flour together. 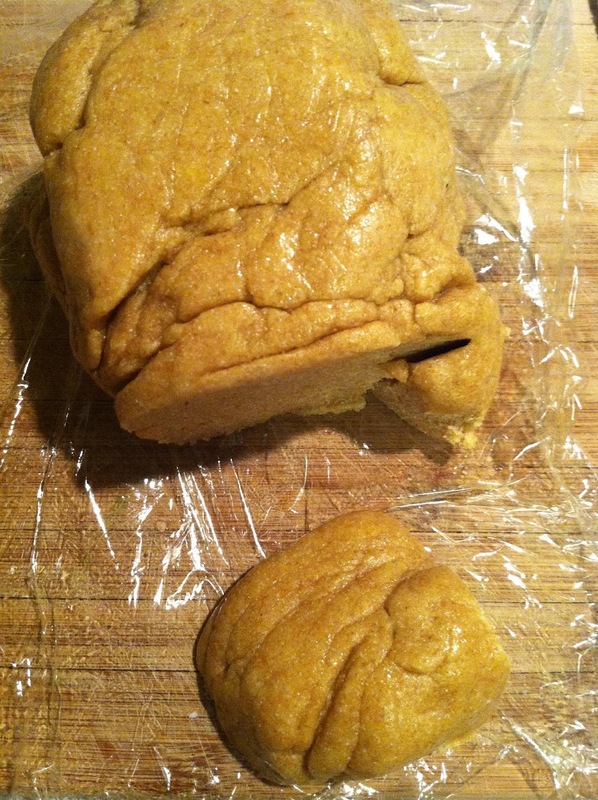 Then knead the dough, pressing it out and flipping it back up on itself, for probably 10 minutes or so. 2. When the dough has been kneaded, rub a tiny bit of olive oil onto your hands (my mom’s Sicilian mother used to swear that this was the secret to youthful-looking hands, but that’s just a bonus). Work the dough into a more structured ball, then wrap it tightly with plastic wrap and let stand for 20-30 minutes at room temperature. 3. Now comes the fun part. 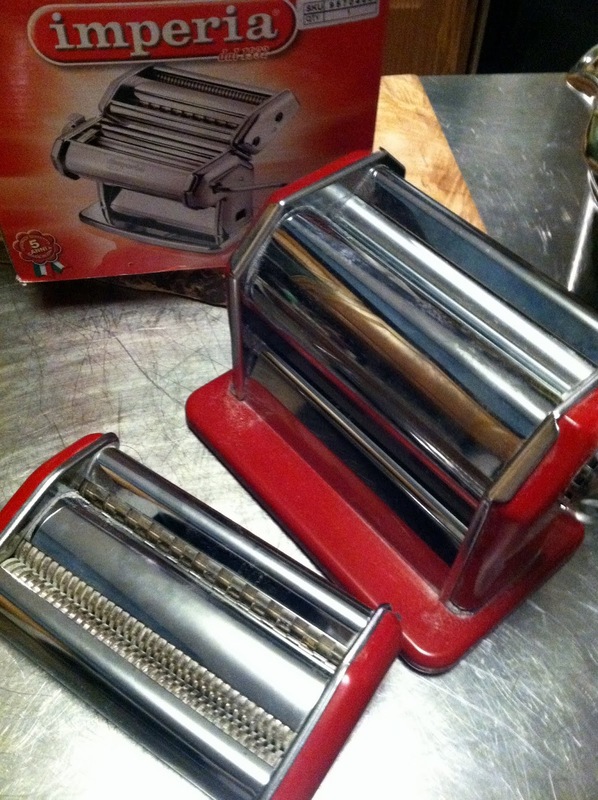 Get a helper, and assemble your Imperia Pasta Machine. Working with approx. 1/4 inch of a piece of the dough at a time, work it through the roller (usually until the second to last thickness setting). 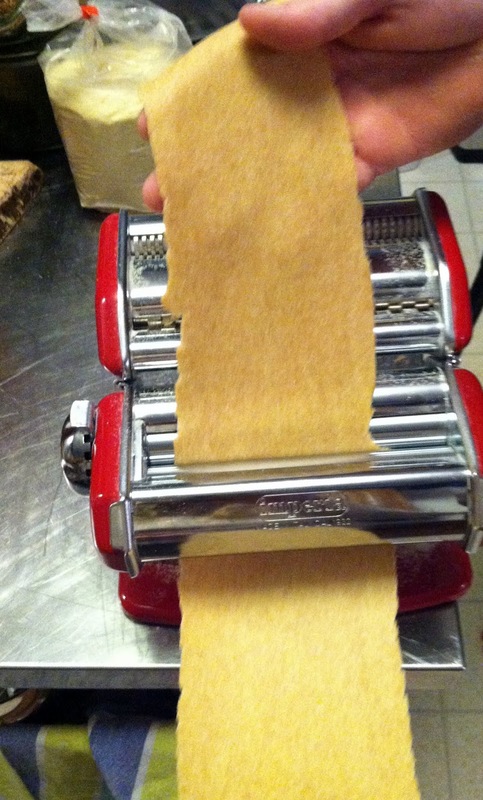 Then, lightly flour the pasta cutting attachment, and work the rolled out sheet of dough through the pasta cutter. 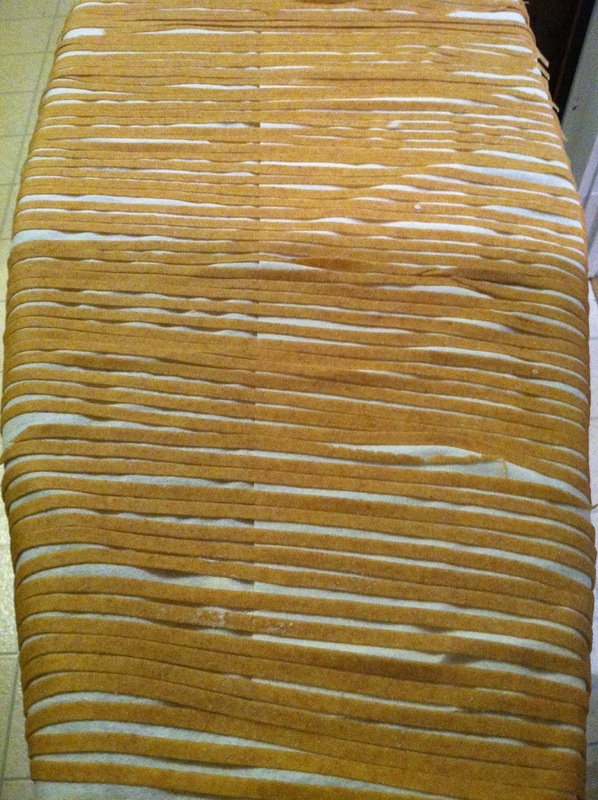 Arrange the freshly cut pasta on a Pasta-Drying Rack (or, ahem, an ironing board covered with paper towels and lightly dusted with flour) and let dry while you cut the rest of the pasta. 4. Bring a pot of water to boil. 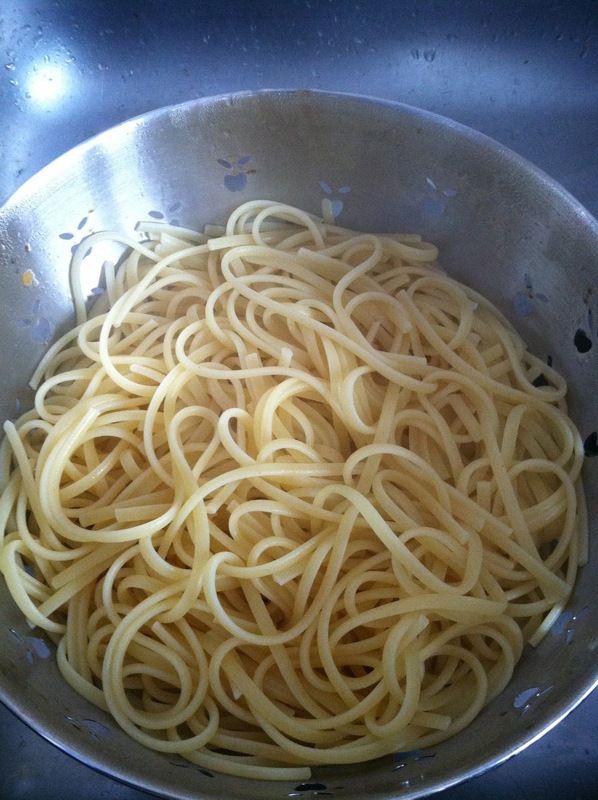 When boiling, add salt, then add the pasta all at once. It should be al dente at 3 minutes, so be careful not to overcook it. 5. Drain the pasta and top with your favorite sauce. 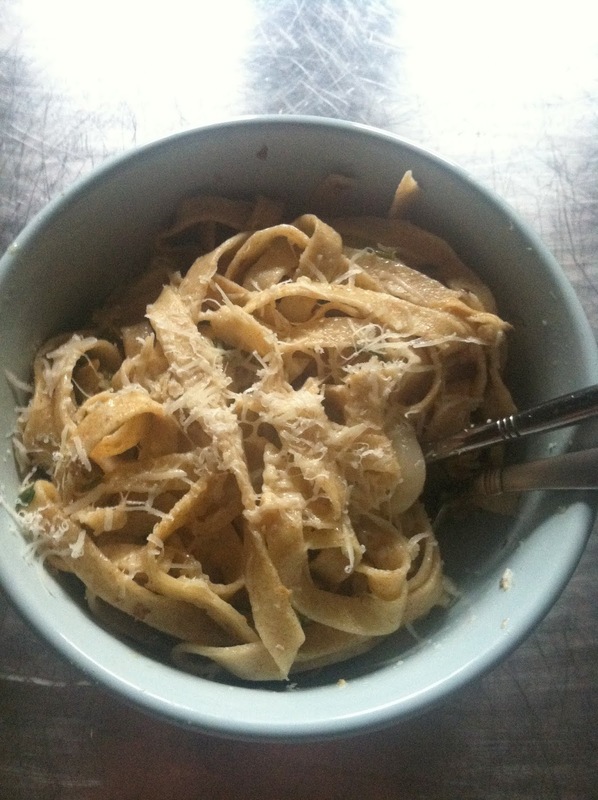 Fresh pasta is a game-changer; it’ll be tough for you to go back to the boxed stuff after this! — On a side note, congratulations to President Obama on his Inauguration Day. Here’s hoping that both parties will be able to work together on bettering our country with the good of the people in mind. 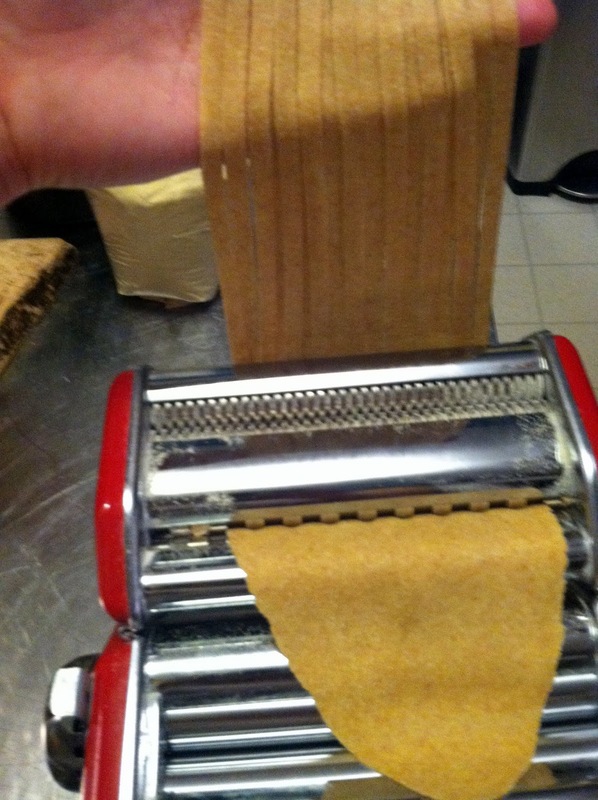 This entry was posted in Imperia Pasta Machine, KitchenAid Mixer, pasta, semolina flour on January 21, 2013 by westyn.